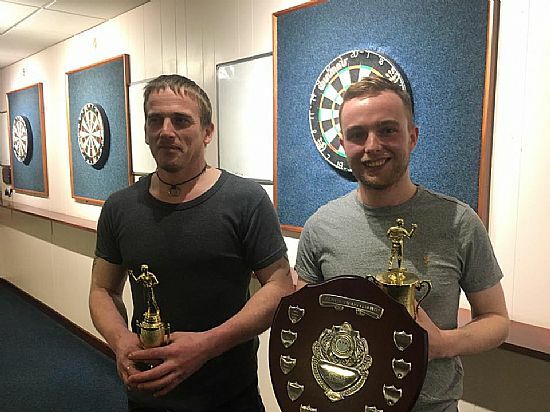 Stevie Linklater and Elizabeth Irvine won the Steven Flett Memorial Shield beating Gary Wilson and Nicky Laird in the final in the Kirkwall Legion on Friday night. The KDDL provided trophies with Belle Bartlett giving flowers and bottles to the prizewinners. £215 was raised towards heart screenings in Orkney. Donations from this event, and two others coming up, will be paid into Freya Dalrymple Memorial Fund at Cardiac Risk in the Young, and will go towards funding future local screening events. The Orkney championships take place in the Kirkwall Legion on Friday night with a 7.30pm start. Spectators welcome to watch to see who will take home the silverware! The following week the men and ladies teams from Shetland will visit for the annual clash, both games taking place in the Legion. The following day, the anniversary shield open darts takes place in the Masonic. Names by 1.30pm. Friday, April 19: Orkney Championships. 7.30pm, Legion. Friday, April 26: KDDL Orkney v Shetland. 7.30pm, Legion. Saturday, April 27: Anniversary Shield (Open). 1.30pm Masonic. Friday, May 3, Open Charity Doubles. 7.30pm Kirkwall Masonic. Saturday, May 4, Shetland B v KDDL Orkney B. Whalsay Boating Club 2pm. Saturday, May 11, Men and ladies leagues trophy presentation night, incorporating Tattie Bogle Charity Shield. 7pm. Masonic. 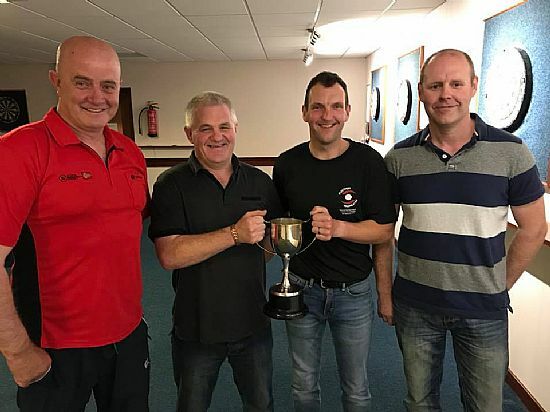 Sanday were winners of the Royal Cup, pictured from left are: Alan Gray, Andrew Green, Ivan Leslie, league president Craig Taylor, and Paul Foubister. 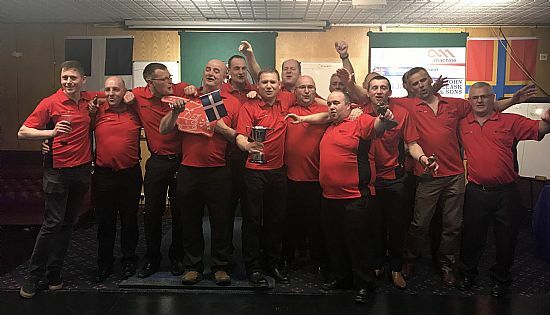 The Royal Cup took place in the Kirkwall Legion on Friday night. Just five teams entered the competition which took place on what was a busy weekend elsewhere. The committee may have to look at the scheduling next season to attract more entries. At the end of the night it was well done to Sanday, winners of the cup, the last domestic team cup of the season. They beat the Orkney Golf Club in the final on the deciding 601 leg. 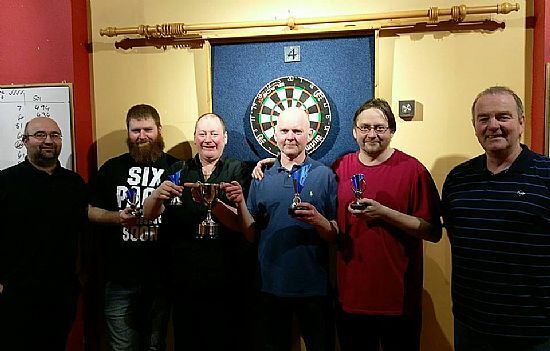 April continues to be a busy time for darts as the season end approaches, with the big match against Shetland at the of the month, as well as the Orkney championships. This Friday is the Steven Flett Memorial Open Mixed Doubles. 7.30pm, in the Legion. All welcome, and donations for the raffle would be much appreciated. This is the first of three end of season charity events, which will raise money for heart screening for the young in Orkney. Donations from the events will be paid into Freya Dalrymple Memorial Fund at Cardiac Risk in the Young, and will go towards funding future local screening events. With the end of the formal competitions, league secretary Brian Moar published the stats for the season, which can be seen in full on the Orkney Darts Facebook page. Topping the table for the most 180s is Kevin Gray with 47, Dennis Watt topping the B league with 28. In total an incredible 740 180's were scored. Most high checkouts of 100 or more was Robbie Stanger with 20, with Jamie Drever the B table topper with 15. Highest Finish: Ian Linklater, Trevor Shearer and Ryan Tulloch all scored the highest possible with 170 checkouts. In the B league the highest was a 164 thrown by Neil Tait. On singles win percentages, Ivan Leslie and Kevin Gray both won 41 out of 44 played. In the B league, Dennis Watt won 23 out of the 24 matches he played. 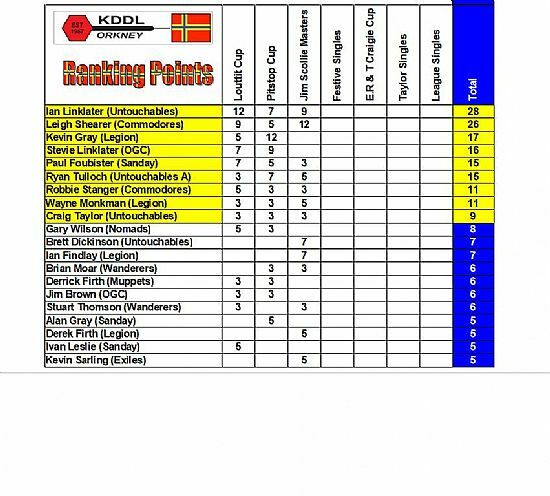 The figures in the tables make impressive reading and highlights the high standard of darts being played in the KDDL. The East B Team. Back row from left, Derrick Firth, Keith Bain, David Henderson, Jamie Drever. Front row from left, Nicol Gray, Stevie Low, Robbie Norquoy, Karl Scott and Kevin Sarling. Missing, Brian Stevenson, Stevie Garner, Jamie Rendall. The East A team. Pictured, back row from left, Derek Firth, Ian Linklater, Kevin Peace, Ryan Tulloch, Robbie Stanger, Stevie Linklater, Ian Findlay. Front row from left, Brian Moar, Gary Wilson, Craig Taylor, Leigh Shearer, Brett Dickinson. Missing, Wayne Monkman. The league matches maybe be over the season, but there are still a number of important fixtures to be played before the end of the KDDL darts season. 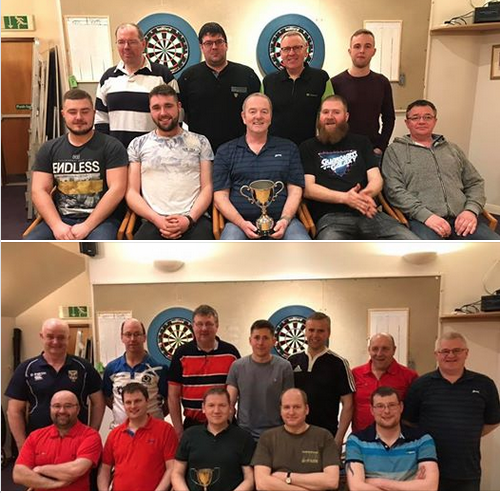 There was victory for both the East A and B darts teams in the annual East v West matches held in the Stromness Golf Club on Friday night. In the annual encounter, the scores were 16-2 in the A match, and 12-6 in the B fixture. On the night, East A captain and league president Craig Taylor thanked the West Mainland Darts League and Stromness Golf Club for their hospitality. Prior to that, and following on from the final rankings tournaments, the teams to play against Shetland were also finalised. The team to represent the KDDL in the first ever B league inter league match are: Captain: Robbie Norquoy, players, David Henderson, Jaime Drever, Erland Ritch, Kevin Sarling, Karl Scott, Stevie Garner, Brian Stevenson, Stevie Low, Nicol Gray, Derrick Firth, and Jaime Rendall. The match will take place in Whalsay on Saturday, May 4. The KDDL Orkney team to take on Shetland was also finalised, being: Captain: Craig Taylor, players: Kevin Gray, Leigh Shearer, Stevie Linklater, Ivan Leslie, Robbie Stanger, Ian Linklater, Alan Gray, Paul Foubister, Derek Firth, Ryan Tulloch, Brian Moar, Wayne Monkman. Reserves: 1. Kevin Peace 2. Brett Dickinson, 3.Gary Wilson 4. Ian Findlay. The match takes place in the Kirkwall Legion on Friday, April 26. With the home team keen to extend their winning run to nine in a row, after setting the eight in a row record last year, Shetland will no doubt be trying all they can to stop them. This Friday the annual Royal Cup takes place in the Legion at 7.30pm. It is open to both A and B league teams, with a plate competition also planned. Let's hope for a good turnout for this, the last team league cup fixture of the season. The following Friday is the first of three charity cups played towards the end of the season, the Steven Flett mixed doubles. 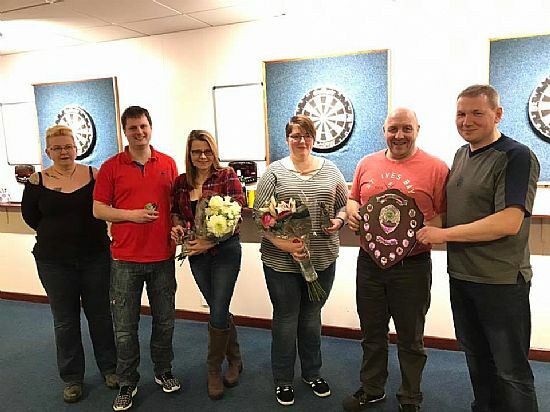 Money raised at that, as well as at the May weekend charity doubles on May 3, in the Masonic, and the Tattie Bogle Charity Shield - which will take place on the darts trophy presentation night on May 11 in the Masonic - will go towards heart screening of young people in Orkney. East v West A: 16-2. East V West B: 12-6. Friday, April 5: Royal Cup (A&B teams) plus plate competition. 7.30pm, Legion. Friday, April 12: Steven Flett Memorial Open Mixed Doubles. 7.30pm, Legion. Friday, May 3, Open Charity Doubles. 7.30pm Masonic. Ivan leslie, centre, is presented with the league singles trophy by league secretary Brian Moar. 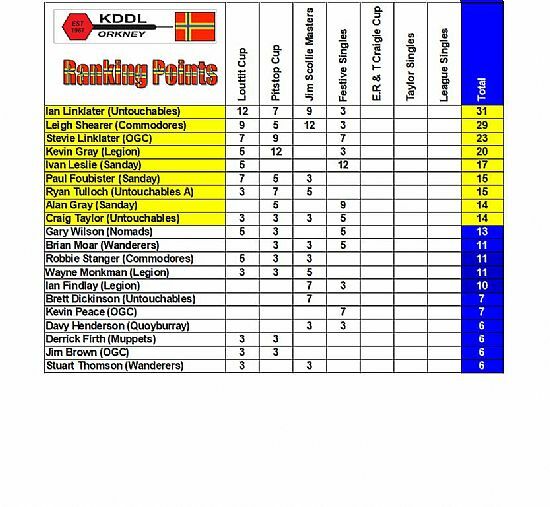 Last week saw the KDDL leagues, kindly sponsored by Williamsons Butchers, and Ranking points competitions draw to their conclusions, and the weekly stats alone speak for the season as a whole. 60 180s, 9 other triple-treble scores and 30 high checkouts would have seemed unthinkable even a few years ago. Admittedly there were several catch-up games played in addition to those scheduled, but many of the scorecards returned were mighty impressive on the reverse side. The Legion sealed the 'A' league title last week, and wrapped up proceedings with an impressive win over Wanderers. 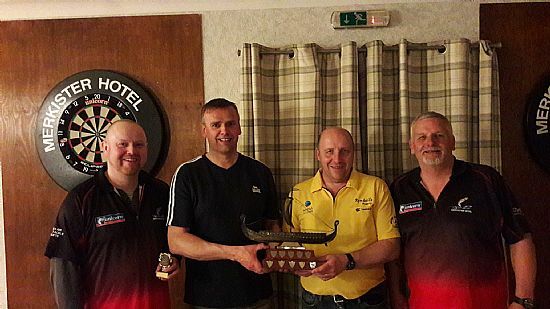 Commodores secured the runners up cup, but only just as a whitewash over Quoyburray 'B' kept them above Sanday on game difference, despite going down 7-5 to the islanders in their final game. Orkney Golf Club sealed 4th place with a comfortable win over Bilco Boys, whilst 5th placed Untouchables narrowly beat 6th place Untouchables 'A'. Warriors had a surprisingly big win over Nomads, who had the luxury of not needing a result, despite Legion Arrows winning over Quoyburray in the battle of the bottom two. 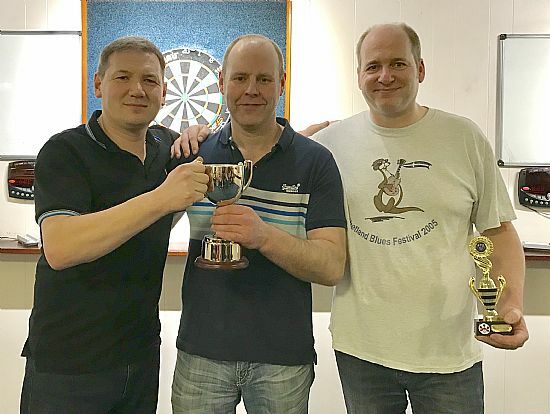 Exiles had aslo wrapped up the 'B' league last week, but they were in sensationally unforgiving mood as Dennis Watt, Erlend Ritch and Kevin Sarling all hit big in their wins over Sands and second placed Shapinsay. 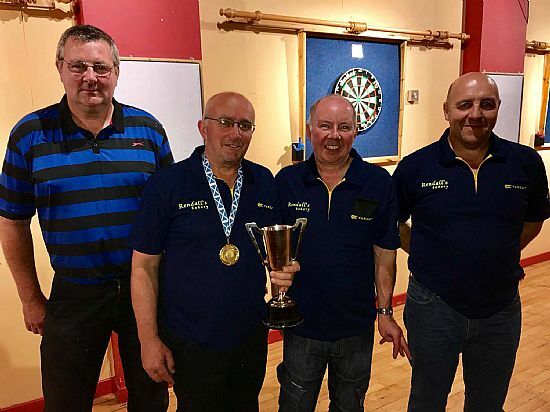 Unfortunately Shapinsay were denied an end of season darts night, as RBL2 could not raise a team before the deadline, and the committee awarded Shapinsay a 12-0 walkover. Murray Arms took third place with wins over Muppets and RBL2, who ended up fourth. Tigers sealed an impressive second half of the season with a decent win over vikings, but only by game difference over Quoyburray and Young Loons. Sands already knew they were picking up the wooden spoon a few weeks ago, but they ended on a positive note, picking up their second point of the season in a draw with third bottom Sanday 'B'. The Masonic was the place to be on Friday night, as this seasons Ranking competitions reached their conclusion. With plenty of players still in the hunt for that elusive top 9 position, not to mention a similar scenarion for 'B' players looking to play in the inaugural 'B' Intercounty match, a big turnout was expected. Susprisingly this was not the case, with only 33 players entering and not a huge turnout of 'B' players. What the night lacked in numbers it certainly did not lack in quality and nail biting entertainment. Ryan Tulloch was in the top 9 before the evening started, but missed doubles against Wayne Monkman cost him his place, as Paul Foubister overtook him on his quarter-final run. Wayne also reached the quarters and put himself in contention for a wild-card, as did both Brian Moar and Kevin Peace, with Kevin narrowly winning their showdown to make the semi-final. The Semi-finals pitched Robbie Stanger and Stevie Linklater against each other once more, with Robbie taking the game 4-1. In the bottom half, Ivan Leslie had steadily gathered momentum over the course of the evening, and he took this into his semi with Kevin Peace, as he won 4-0, although Kevin had a few chances that went a begging. The final was the icing on the cake of a monumental KDDL season. Robbie and Ivan throw some titanic tungsten and two 180s, a 177 and checkouts of 120, 122 and 151 between them in eight legs had an appreciative audience salivating. There were numerous occasions where a particular score or finish seemed pivotal, only for the other player to hit back. In the end however, it was Ivan who hit double 12 and secured his first League Singles title, denying Robbie the chance for three in succession. The East v West encounter takes place in the Stromness Golf Club on Friday night with a bus organised to take the KDDL players leaving the old bus station at 6.30pm. Please note there is an absolute zero tolerance policy in place to taking any alcohol onto the bus, opened or otherwise. 180s were hit by: Brian Moar, Ian Findlay, Graham Firth, Billy Ward, Jim Brown, Ian Linklater, Alan Findlay, Ryan Tulloch, Robert Hutchison, Stevie Moar, Freddie Tait, John Garson, Robbie Norquoy, Neil Tait, Gary Drever, Richard Polson, George Low, Nicol Gray, Leigh Shearer, Derek Firth (two), Kevin Gray (two), Alan Gray (two), Ben Hogan (two), Paul Foubister (two), Keith Bain (two), Robbie Stanger (two), Kevin Sarling (two), Kevin Peace (three), Brett Dickinson (three), Stevie Linklater (four), Ivan Leslie (five), Erlend Ritch (five) and Dennis Watt (five). Other big scores came from: Paul Foubister (171), Wayne Small (171), Craig Moar (174), Aaron Mitchell (177), Ivan Leslie (177), Erlend Lennie (171, 171) and Neil Drever (171, 174). Ton+ checkouts were scored by: Colin Barnett 100, Kevin Sarling 100, Gary Wilson 101, Brian Murray 103, Ryan Tulloch 104, Jak Kissick 110, Ian Linklater 112, Jamie Marwick 117, Kevin Gray 118, Ben Hogan 121, Wilfie Tulloch 131, Freddie Tait 133, Kevin Peace 133, Colin Kirkpatrick 141, Richard Polson 142, Stevie Garner 151, Stevie Moar 164, George Low (100, 105), Jamie Drever (100, 116), Paul Foubister (103, 105), Robbie Stanger (115, 122), Dennis Watt (115, 140) and Ivan Leslie (100, 120, 151). Richard Polson, centre, presents Kevin and Shona Gray with the mixed doubles cup. Runners up, Nicky Laird and Gary wilson, pictured on the outside. The penultimate week of KDDL league action has passed, and both League champions are now known. Two convincing wins for the Legion over Legion Arrows and Warriors were to prove enough to secure their tenth 'A' league title in succession. Down at the deep end, the Nomads secured a valuable point against Wanderers, which set up a tense Saturday night clash with the Arrows, with both teams knowing a win would be crucial in any attempt to beat the drop. A close match was anticipated, and so it panned out with both teams having to settle for a draw, a result which favours the Nomads, but the Arrows still have a slim possibility of survival. It's been coming for what seems like an age, but pre-season favourites, and KDDL debutantes, Exiles finally secured the 'B' league title following a 10-2 win over Sanday 'B', which they then followed up with an 11-1 pummelling of the Young Loons. Shapinsay have all but secured the second promotion spot with a win over Murray Arms, and a draw with Tankerness. The Sands lost out to Quoyburray and are unfortunately assured of the wooden spoon, but there have been some real signs of improvement recently, which they will hopefully build on next season. 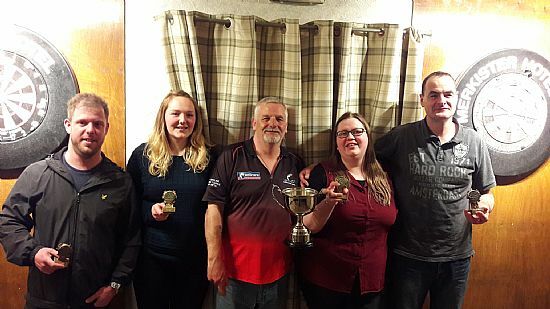 Friday night saw the Legion play host to the mixed doubles, with the champions going forward to compete for the Orkney Mixed Doubles title on the Orkney Championships night in April. There was a disappointing turnout of only 8 couples, so the decision was made to play two groups of four, with the winners meeting in the final. Kevin and Shona Gray progressed from group one and met Gary Wilson and Nicky Laird in the final. Although there wasn't much in it from a scoring point of view, superior finishing ensured the Gray's mantelpiece had one more trophy sitting on it by the end of the evening. This Friday sees the last of the ranking competitions for the season, the league singles, with the top 9 after the competition booking a place in the team to play Shetland. They will then meet up on Sunday evening to vote for three wildcards plus reserves. In the event of a tie for 9th place, a playoff will take place before the top 9 meet. The 'B' team will also be confirmed after the league singles, unless there is a tie, in which case a similar playoff will ensue at the same time as the main ranking playoff (should it be required). 180s this week were hit by: Simon Parry, Colin Kirkpatrick, Kevin Peace, Andrew Moar, Lee MacPherson, Craig Taylor, Ian Linklater, Brett Dickinson, Alan Findlay, Trevor Shearer, Stevie Garner, Jamie Rendall, Neil Drever, Jason Cook, Keith Bain, Jamie Drever, Gary Drever, Neil Croy, Derek Firth, John Hamilton, Nicol Gray, Erlend Ritch, Graham Firth, Gary Wilson, Erlend Lennie, Ivan Leslie, Ian Findlay (two), Kevin Gray (two), Ryan Wilkie (two), Robbie Stanger (two), Kevin Sarling (three) and Dennis Watt (six). Ryan Wilkie also scored 177 whilst John Thomson had a 171. High checkouts were hit by: Neil Croy 100, Wayne Monkman 101, Neil Tait 105, Cammy Scott 106, Erlend Ritch 109, Derek Firth 112, Stevie Moar 112, Dennis Watt 112, Darryl Robertson 113, Alan Findlay 116, Ben Hogan 117, Jamie Rendall 117, Graham Firth 120, Ryan Tulloch 135, Ian Findlay 136, Raymie Rendall 148 and Kevin Gray 140, 141. Legion 10, Legion Arrows 2; Wanderers 6, Nomads 6; Quoyburray 'B' 1, OGC 11; Bilco Boys 3, Untouchables 9; Untouchables 'A' 6, Warriors 6; Legion 9, Warriors 3; Legion Arrows 6, Nomads 6. Exiles 11, Young Loons 1. The twentieth week of KDDL league action has passed, and what a week it was! Very little has been decided for definite yet in either league. The Legion finally found themselves on the wrong end of a result as the Commodores beat them 7-5 in a match of extremely high quality. This leaves the Commodores only two points behind, but the Legion have a game in hand. Sanday got the better of the Golf Club in the race to third spot, while the Untouchables had a hefty win over Quoyburray 'B', ensuring that the Tankerness men will be playing in the 'B' league next season. The Arrows gave themselves a huge lifeline with a deserved 7-5 win over Wanderers and, with games to play yet against Quoyburray 'B', it is a possibility that their catch-up match with the Nomads could be a decider in seeing who goes down in second bottom position. The Exiles worked hard to win over Quoyburray, but still remain only promotion candidates at the moment, as there is the slightest of mathematical probabilities that they could still end up in third place. Shapinsay retained their grip on second place with a win over the Young Loons, whilst RBL2 kept their faint hopes alive with a solid win over bottom placed Sands. 180s were hit by: Billy Ward, Derek Firth, Kevin Gray, Ian Findlay, Stuart Thomson, Keith Brumpton, Gordy Rendall (OGC), Stevie Linklater, Alan Gray, Paul Foubister, Brett Dickinson, Ben Johnston, Alan Findlay, Jamie Marwick, Steven Skea, Andrew Rendall, Davy Henderson, Dennis Watt, Darryl Robertson, Robbie Stanger (two), Graham Firth (two), Ivan Leslie (two), Nicol Gray (two) and Don Wilson (two). Muppets 5, Tigers 7; Tankerness 10, Vikings 2; Shapinsay 8, Young Loons 4; Sanday 'B' 5, Murray Arms 7; Quoyburray 4, Exiles 8; RBL2 11, Sands 1. Wanderers v Legion; Legion Arrows v Sanday; Commodores v Quoyburray 'B'; OGC v Bilco Boys; Untouchables v Untouchables 'A'; Nomads v Warriors. Kevin Gray lifts the Tennent's Kirkwall Open silverware, taking the title and £500 prize for the third time, having won in 2016 and 2012. Winner – Kevin Gray - £500. Full report on the Tennent's Kirkwall Open page. B Singles Cup winner Erland Ritch beat least year’s winner Jamie Drever 5-3 in the final. League vice-president Steven Linklater made the presentation. 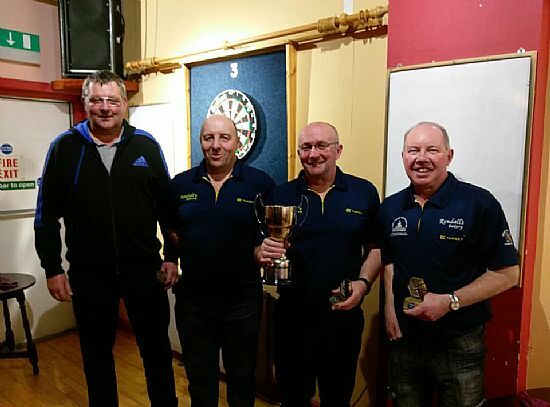 The B League singles took place in the Kirkwall Masonic on Friday night. With places up for grabs on the plane for the first ever B match against Shetland later this season, a large entry was expected. It was a surprise that there was not more than the 22 entries, but numbers did not detract from the good quality of many of the games. Jamie Drever won the cup last year, and he made his way through to the final, taking out David Henderson in the quarters and Brian Stevenson in the semi. In the other half of the draw, Erland Ritch beat Jamie Rendall in the quarter-final and then beat Stevie Garner in the semi, with the help of two 180's. They say it is harder to retain a trophy than to win it, and this proved to be the case. The final was a close one before Erland took control and won the cup by a 5-3 scoreline. Only three weeks remain in the KDDL league season, and everything is still all to play for, with no team guaranteed silverware, promotion or relegation as yet. Several postponed games have their part to play in this, and the committee agreed at last week's meeting that all games must be played by Thursday, March 21, at the very latest. 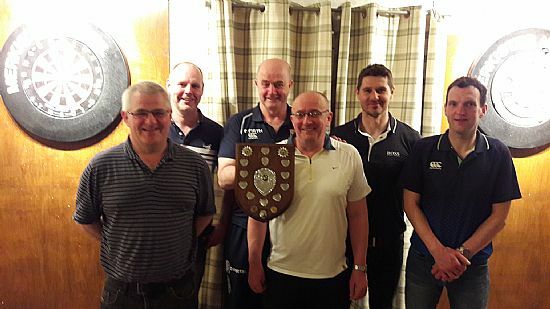 The Legion took a massive stride towards another 'A' league title this week, narrowly beating perennial challengers Orkney Golf Club in a high quality match. That leaves the Commodores as the only team left in the hunt but they must beat the Legion in their encounter and hope that the Arrows and Wanderers can do likewise! As it stood, the Commodores were made to work hard against Wanderers this week, but ultimately came away worthy winners. Elsewhere, Sanday kept up their chase for the runners-up spot by squeaking a win in the Masonic derby against Untouchables. Untouchables 'A' were also winners by the smallest margin over the Bilco Boys, whilst the Warriors recorded a good win over struggling Quoyburray 'B'. Narrow victories seemed to be in vogue last week, as three out of five of the 'B' matches played ended up close. Shapinsay, Muppets and RBL2 all saw off Tigers, Vikings and Tankerness 7-5 respectively. The Young Loons put in another good performance in their win over Sanday 'B', but the chance for promotion has passed them by this season. The Murray Arms preserved their slim chance of promotion with a convincing victory over Quoyburray. This Saturday sees the 11th Tennent's Kirkwall Open take place in the Masonic, with players requiring to enter before 1.30pm. It is sure to be a great day of darts as always, and it sounds on the grapevine like there may be an increased number of participants from “doon sooth” coming up to take part. Players are asked to inform the 'control desk' as soon as possible once games finish, in order to allow the day to progress smoothly. There will also be the usual bottle stall and raffle with some great prizes on offer. Any donations to the bottle stall will be very much appreciated. 180s this week were hit by: Kevin Gray, Ian Findlay, Kevin Peace, Stevie Linklater, Freddie Tait, Alan Gray, Ian Linklater, Craig Taylor, Robert Hutchison, Lee MacPherson, Roy Foubister, Ryan Tulloch, Jamie Marwick, Alan Pirie, Jason Cook, Nicol Gray, Derek Ward, Andrew Rendall, Billy Ward (two), Jim Hamilton (two), Davy Henderson (three), Erlend Ritch (three) and Ivan Leslie (four). Neil Drever had a score of 171, whilst Ian Findlay scored 177. High checkouts were hit by: Stevie Linklater 100, Aaron Mitchell 100, Craig Moar 100, Davy Henderson 100, Lee MacPherson 108, Stevie Moar 109, Brian Moar 110, Steven Low 110, Brett Dickinson 111, Jason Cook 111, Colin Kirkpatrick 114, Keith Brumpton 120, Stevie Garner 122, Paul Foubister 128, Erlend Ritch 150, Ian Linklater and Trevor Shearer both caught the big fish, taking out a maximum 170 finish each. Legion 7, OGC 5; Wanderers 3, Commodores 9; Sanday 7, Untouchables 5; Quoyburray 'B' 2, Warriors 10; Bilco Boys 5, Untouchables 'A' 7. Tigers 5, Shapinsay 7; Vikings 5, Muppets 7; Tankerness 5, RBL2 7; Young Loons 9, Sanday 'B' 3; Murray Arms 9, Quoyburray 3. Legion v Legion Arrows; Wanderers v Nomads; Sanday v Commodores; Quoyburray 'B' v OGC; Bilco Boys v Untouchables; Untouchables 'A' v Warriors. Exiles v Sanday 'B'; Sands v Quoyburray. Past long serving committee league treasurer Derek Linklater is pictured presenting KDDL league doubles winners Paul Foubister and Ivan Leslie with the cup. They beat Robbie Stanger and Stevie Linklater 5-4 in the final. Ivan won the high finish prize donated by Ian Linklater with a 152. Over £200 of prize money was shared on the night. Winners £136 runners up £70. 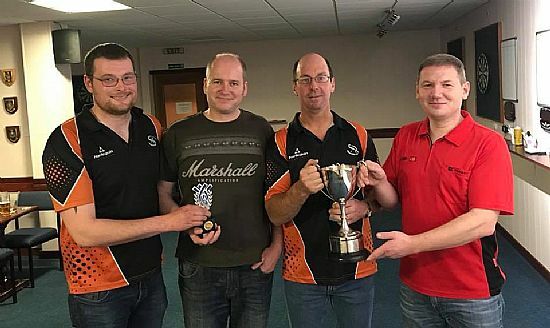 The 2019 KDDL League Doubles was played in the Legion last Friday, and there was an excellent entry of 21 pairs all vying to lift the prestigious trophy. 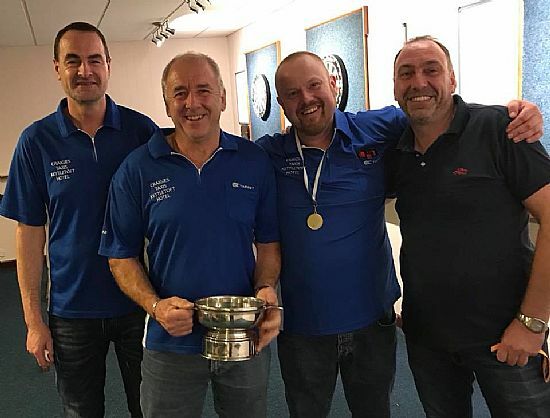 Last years champions were Robbie Stanger and Stevie Linklater, and they were playing well again from the off, and soon found themselves facing the dangerous pairing of Kevin Gray and Derek Firth. With the Legion pair just slightly off the boil, it was Robbie and Stevie who triumphed 4-1. The bottom half of the draw saw Sanday duo Paul Foubister and Ivan Leslie play some stonking darts early on. Both were gunning for the bottle of vodka, kindly donated by Ian Linklater for the highest checkout, and it was a 152 from Ivan which eventually saw him take it at the end of the night. There was also a 12 dart leg from the pair in their quarter-final against Bruce Moar and Kevin Peace. The other Legion pairing of Wayne Monkman and Ian Findlay had a tough route to their semi against the Sanday pair and perhaps it had taken its toll, as Paul and Ivan progressed 4-0. The final was a mouth-watering prospect with by far the best two pairs on the night squaring up. Paul and Ivan won the bull-up, but with the first four legs played going against the throw, it appeared it may not be as decisive as it sometimes proves. The first four legs saw some nervy darts emerging amongst some really good stuff, until finally Paul and Ivan made it count to go 3-2 up. Robbie and Stevie hit right back, before each pair once more won on their own throw to force a deciding leg. Both pairs had chances at the winning double before Ivan finally checked out on double 15 to recapture the trophy Paul and himself last won in 2010. 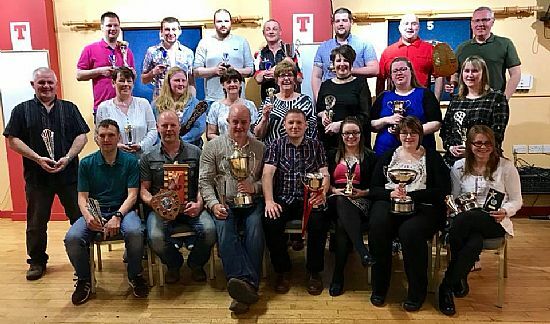 The Masonic plays host to the next two competitions with the 'B' league Singles on Friday night, and then the flagship competition of the year, the Tennent's Kirkwall Open a week on Saturday. 180s were hit by: Derek Firth, Wayne Monkman, Stevie Linklater, Keith Brumpton, Martin Peace, Gary Brown, Jamie Marwick, Davy Henderson, Jason Cook, Steven Low, Nicol Gray, Don Wilson, Kevin Sarling, Robbie Stanger, Robbie Norquoy, Billy Ward (two), Stevie Moar (two), Lee MacPherson (two), Darryl Robertson (two), Paul Foubister (three) and Ivan Leslie (four). Keith Brumpton also scored 177. Ton plus checkouts were scored by: Brian Moar 100, Keith Bain 103, Robert Hutchison 105, Kevin Gray 110, Paul Foubister 112, Freddie Tait 117, Jason Cook 117, Michael Muir 120, Toby Penwarden 122, Ian Linklater 137, Ivan Leslie 100, 152 and Stevie Linklater 103, 107. Untouchables 3, Legion 9; OGC 10, Wanderers 2; Commodores 11, Legion Arrows 1; Warriors 4, Sanday 8; Untouchables 'A' 9, Quoyburray 'B' 3; Nomads 5, Bilco Boys 7. Sanday 'B' 4, Tigers 8; Shapinsay 9, Vikings 3; Quoyburray 6, Young Loons 6; Sands 4, Murray Arms 8; RBL2 5, Exiles 7. Commodores v Legion; Legion Arrows v Wanderers; OGC v Sanday; Untouchables v Quoyburray 'B'; Warriors v Bilco Boys; Nomads v Untouchables 'A'. Muppets v Tigers; Tankerness v Vikings; Shapinsay v Young Loons; Sanday 'B' v Murray Arms; Quoyburray v Exiles; RBL2 v Sands. Jamie Drever is pictured being presented with the Under 30's trophy by KDDL vice-president Stevie Linklater, while Gary Wilson receives the runners-up trophy from league president Craig Taylor. THE KIRKWALL Legion was the venue on Friday as 29 young players competed in the Under-30s Open Singles. 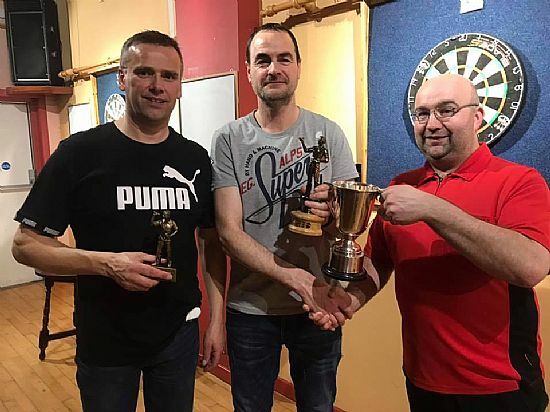 Organised by the Kirkwall and District Darts League, the competition is open to any players meeting the age criteria, with the trophy sponsored by Orkney Aggregates. Stevie Linklater provided a bottle of gin for the highest finish. There was a good mix of KDDL players and players from outwith the league taking part on the night. Winner for the last two years in a row Erlend Lennie could not make it a hat-trick of wins, however, going out to Nicol Gray in the first round. Making their way to the semi-finals were Jamie Drever who progressed into the final, beating Mark Shearer 4-2. On the other board, it was Gary Wilson who went through 4-1 against Alan Findlay. The final went the full distance, and the match was all square at 4-4 in the race to five. In the last leg Jamie showed some real class, taking out a 127 finish on the bull to claim the title for the first time, also winning £72 prize money and the bottle of gin. Gary won £35 second prize from the money-in money out competition. The semi-finalists won £10 each. The Kirkwall and District Darts League season entered its last quarter and there is still nothing decided yet at the business ends of each league. 'A' league leaders the Legion had their match postponed so it allowed the chasing pack a chance to catch up, which they all did. The Commodores blitzed the Nomads, whilst Sanday recorded two thumping victories over both Wanderers and Untouchables 'A' to move clear in third, although the Golf Club remain close behind . Wanderers week did not get any better with a decisive second half ensuring Untouchables took the spoils in their match, whilst the Bilco Boys resigned Quoyburray 'B' to yet another defeat. In the 'B' league the Exiles finally lost their 100% record, as they were held to a draw in the Murray Arms, whilst Shapinsay closed the gap slightly with a win over Muppets. The Young Loons closed the gap on the experienced Quoyburray side, who lost out to the resurgent Tigers. And in the lower reaches it was Vikings who came out on top in their game with Sanday 'B', to draw level on points with them. This Friday sees the League Doubles take place in the Legion and, although no longer a ranking competition, it remains one of the most prestigious competitions in the calendar and Stevie Linklater and Robbie Stanger will undoubtedly be looking to retain the title. Then the following Friday is the big event for the 'B' league boys, with the 'B' league singles up for grabs in the Masonic. 180s this week were hit by: Simon Parry, Stuart Thomson, Ian Linklater, Graham Firth, Cammy Scott, Kevin Peace, Bruce Moar, Freddie Tait, Billy Ward, Paul Firth, Trevor Shearer, Graham Reid, Steven Griffiths, Hamish Baillie, Neil Tait, Jamie Marwick, Kevin Sarling, Jason Cook, Lee MacPherson (two), Stevie Garner (two), Keith Brumpton (three) and Gary Wilson (three). Ryan Wilkie hit a 174. High checkouts were hit by: Lee MacPherson 100, Keith Bain 100, Ryan Tulloch 100, Paul Foubister 101, Erlend Ritch 101, Stuart Thomson 102, Sam Caithness 104, Robbie Norquoy 105, Neil Drever 108, Gary Wilson 110, Kevin Peace 115, Stevie Linklater 116, Ivan Leslie 124, Kevin Sarling 130, Grant Harrold 132, Jamie Marwick 100, 102, Trevor Shearer 101, 148, John Thompson 114, 146, Jamie Drever 116, 127, Don Wilson 118, 144 and Robbie Stanger 120, 156. Sanday 9, Wanderers 3; Wanderers 4, Untouchables 8; Legion Arrows 1, OGC 11; Commodores 12, Nomads 0; Sanday 9, Untouchables 'A' 3; Quoyburray 'B' 3, Bilco Boys 9. Tigers 9, Quoyburray 3; Vikings 7, Sanday 'B' 5; Tankerness 1, Exiles 11; Muppets 1, RBL2 11; Young Loons 10, Sands 2; Murray Arms 6, Exiles 6; Shapinsay 9, Muppets 3. Jamie Drever 5, Gary Wilson 4. Quoyburray 'B' v Warriors; Bilco Boys v Untouchables 'A'. Tigers v Shapinsay; Vikings v Muppets; Tankerness v RBL2; Young Loons v Sanday 'B'; Murray Arms v Quoyburray; Exiles v Sands. Cup sponsor and league president Craig Taylor, left, presents winner Kevin Gray with the Taylor Singles Cup with alongside him is runner-up Leigh Shearer. This years ranking points competitions to select the team to play Shetland are beginning to draw to a close with the penultimate competition, The Taylor Singles, being played in the Legion last Friday night. The ranking points tables are tight, and the standard on show was simply breathtaking all night long, despite the obvious nervous tension in the air. By quarter-final time many of this years form players were still involved. Leigh Shearer squeezed by Robbie Stanger, whilst Derek Firth narrowly defeated Ryan Tulloch, with both virtually cementing their place in the team. 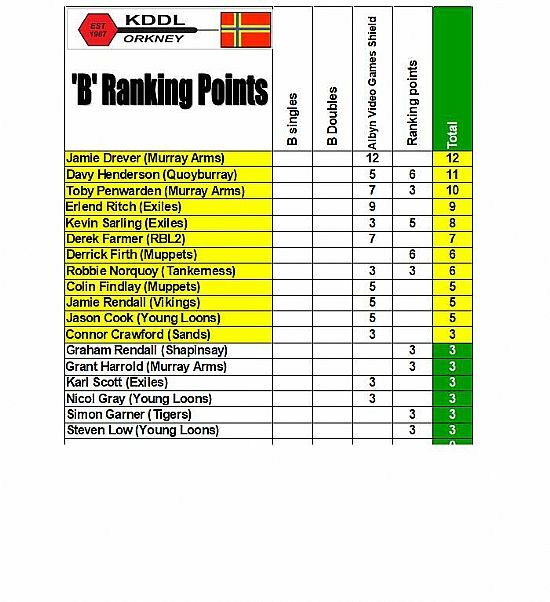 Bruce Moar added some much needed points to his tally but failed to get the better of Kevin Gray, whilst Ivan Leslie finally stopped the rampaging Kevin Sarling from the 'B' League. Leigh secured yet another final berth with a 4-1 win over Derek, despite Derek having a blistering start. The other semi-final was a slightly more dour affair, but eventually Kevin pipped Ivan, also 4-1. Kevin and Leigh had between them been involved in 4 of the 5 finals this season, so it was little surprise that they were contesting this one as well. Leigh played reasonably well in the final, as his 72.4 average suggests but Kevin was in sensational form and got better and better as the match progressed. Leigh managed to reduce the deficit after three legs to 2-1 but that was as close as he would get. With Kevin averaging over 90 for much of the match (finishing with 87.3) he stepped up a gear after Leigh hit his double, taking the fourth leg in fourteen darts and the fifth in a superb 11 darts, much applauded by the onlooking crowd. Leigh had chances in the sixth leg but spurned them, only for Kevin to retain the cup with a 110 checkout. The young talent of Orkney get their chance to shine on Friday in the Legion, as the Under 30's Open singles is played. The place was rocking last year with the jukebox pumping and some really good darts on show, more of which will be expected this time around. 180s were hit by: Trevor Shearer, Ian Findlay, Simon Parry, Jim Hamilton, Fraser Laird, Davy Henderson, Jamie Rendall, Brian Stevenson, Kevin Sarling, Leigh Shearer, Derek Firth, Ryan Tulloch (two), Martin Peace (two), Keith Brumpton (two), Billy Ward (two), Ivan Leslie (two), Gary Wilson (two), Neil Tait (two), Robert Hutchison (three), Brett Dickinson (three), Robbie Stanger (four) and Kevin Gray (six). Ryan Wilkie had a 177. Ton plus checkouts were scored by: Ian Linklater 100, Ryan Wilkie 100, Keith Brumpton 102, Brian Moar 105, Kevin Sarling 107, Andrew Moar 108, Jamie Rendall 108, Erlend Lennie 110, Kevin Gray 110, Andrew Clouston 116, Ian Munro 119, Nicol Gray 120, Stuart Thomson 125, Ryan Tulloch 170, Stevie Linklater 100, 101, Robert Hutchison 100, 118, Robbie Stanger 114, 115, Davy Henderson 115, 116, Jamie Drever 119, 120, Derek Firth 105, 116, 116 and Leigh Shearer 111, 126, 126. OGC 5, Commodores 7; Bilco Boys 3, Sanday 9; Nomads 8, Quoyburray 'B' 4. Sands 1, Tigers 11; Quoyburray 10, Vikings 2; Sanday 'B' 2, Tankerness 10; Murray Arms 3, Tigers 9. Untouchables v Legion; OGC v Wanderers; Commodores v Legion Arrows; Warriors v Sanday; Untouchables 'A' v Quoyburray 'B'; Nomads v Bilco Boys. Sanday 'B' v Tigers; Shapinsay v Vikings; Muppets v Tankerness; Quoyburray v Young Loons; Sands v Murray Arms; RBL2 v Exiles. Stevie Garner and Brian Stevenson, centre, won the B league doubles, beating Dennis Watt and Karl Scott 5-0 in the final. Pictured at either side are KDDL committee members Brian Moar and Robbie Norquoy. Another busy week in the KDDL, and it was the 'B' league boys who were involved in cup action this time, with the 'B' league doubles in the Masonic on Friday night. Considering there are places on the plane to Shetland to play for, the entry of 13 pairs was a little disappointing, but those who are really keen were in attendance. The night got off to a good start with Graham Rendall from Shapinsay hitting a 180 in one of the first legs, but there were obviously a lot of nerves on show as the doubling on the night was generally pretty poor. In the top half of the draw, Brian (Tone) Stevenson and new Tigers' signing Stevie Garner made steady progress towards the Semi-final where Erlend Ritch and Kevin Sarling were waiting. Double trouble was the order of the day once again, with the match eventually being taken to 3-3 where there was a short intermission for a toilet break, and possibly some T for the vicar! Erlend narrowly missed tops on a 105 finish with Tone requiring 130, and he rolled back the years in style, hitting the bull dead centre to put them into the final. Nicol Gray and Steven Low had been somewhat fortuitous to reach the semi-final, having had match darts against them in the previous rounds, but their luck ran out against the strong Exiles pairing of Dennis Watt and Karl Scott. The Young Loons were first to the double in 6 of the 7 legs, but it was Dennis who secured passage to the final by hitting the double. The final was somewhat of an anti-climax, given that a close match was expected. Stevie Garner was in top form in the final, easily the best player on show, hitting high score upon high score, and Tone was playing steady and finishing with aplomb. Birthday boy Karl had perhaps enjoyed his day a bit too much by this point, and Dennis was not showing his usual form, as Tone eventually hit the winning double to seal the match 5-0. 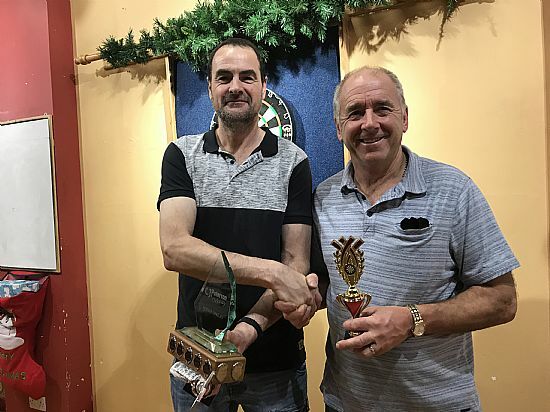 Great to see a legend of yesteryear back enjoying his darts and playing well, and it obviously meant a great deal to Tone to pick up some silverware. 180s this week were hit by: Kevin Gray, Neil Croy, Ian Findlay, Martin Peace, Stuart Thomson, Graham Firth, Robbie Stanger, Billy Ward, Freddie Tait, Stevie Linklater, Ryan Wilkie, Alan Gray, Steven Griffiths, Dennis Watt, Ian Munro, George Low, Hamish Baillie, Davy Henderson, Steven Low, Aaron Edwardson, Graham Rendall, Wayne Small (two) and Kevin Sarling (two). Ryan Wilkie also scored 177, whilst Ryan Tulloch hit a 171 in an 11 dart doubles leg with Alan Findlay. Commodores 9, Untouchables 3; OGC 10, Nomads 2; Sanday 9, Quoyburray 'B' 3. Tigers 3, Exiles 9; Vikings 7, Sands 5; Tankerness 4, Quoyburray 8; Muppets 7, Sanday 'B' 5; Young Loons 6, Murray Arms 6. Legion v Warriors; Wanderers v Untouchables; Legion Arrows v OGC; Commodores v Nomads; Sanday v Untouchables 'A'; Quoyburray 'B' v Bilco Boys. Tigers v Quoyburray; Vikings v Sanday 'B'; Tankerness v Shapinsay; Muppets v RBL2; Young Loons v Sands; Murray Arms v Exiles. The Craigie Cup presentation, sponsored by Craigie Butchers. 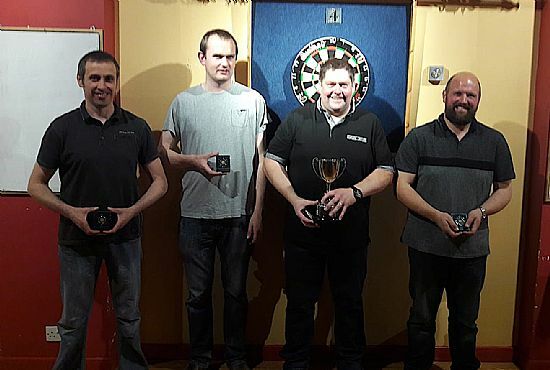 Pictured from left, are Thorfinn Craigie, winner Kevin Gray, Eddie Craigie, runner-up Robbie Stanger, A League highest finsh winner Derek Firth. Missing is B League highest finish winner Karl Scott. The Tankerness Hall was the place to be last Friday night for the fifth of this years Ranking Cup competitions as the Craigie Cup took place. Much hard work from Robbie Norquoy and the local lads had been put in preparing the venue and it was in excellent playing order. 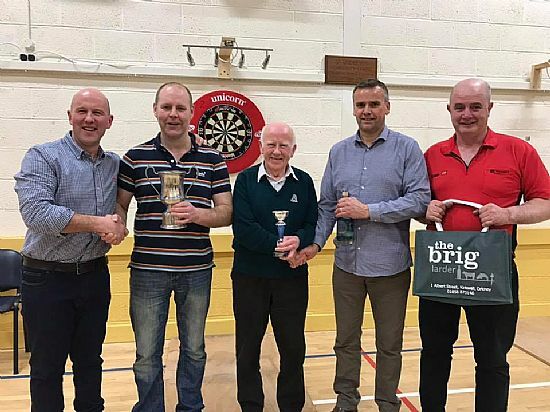 With sponsors Thorfinn and Eddie Craigie in attendance and putting up sandwiches, prizes for the winner, runner-up and highest checkouts for both 'A' and 'B' players, there was an added incentive for everyone to perform, and perform they did. There are always some cracking first round matches, and when Ian Linklater paired against Derek Firth it was always going to produce great darts. Ian missed a few doubles, but Firthy did what he does best and took out 152 under heavy pressure to win the game, and eventually took the 'A' checkout prize with it. Almost immediately, Karl Scott from the 'B' league checked 157 in his match with Ryan Wilkie to claim the 'B' prize. Notable performances on the night came from Darryl Robertson who reached the quarter-finals, as did Nicol Gray who put out Brian Moar and Paul Foubister on the way. Obviously the added incentive of a 'B' trip to Shetland this year was inspiring the lower league players to up their game. Into the semi-finals, and it was two doubles pairings who found themselves playing against their partners. Kevin Gray played Derek Firth in one of the best games ever seen in the KDDL. Kevin came from 3-2 down to win with 13 then 14 dart legs, with the worst leg in the match being 16 darts, tremendous stuff! On the other board things were a bit more tense as Stevie Linklater and Robbie Stanger squared up. Once more it went the distance but with a dart or two missed at double from the 'Stoneman', it was eventually Robbie who progressed. The final between Robbie and Kevin was a fairly one-sided affair, with Robbie just failing to hit enough trebles to put the pressure on. Kevin raced to a 4-0 lead, only for Robbie to produce his best leg and claw one back. 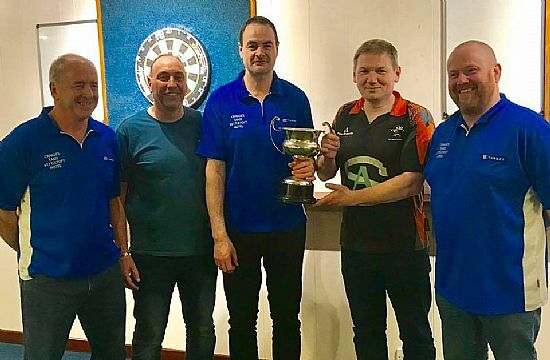 Kevin retaliated and clinched the final leg, and retained the trophy, with a terrific 13 dart leg in front of a sizeable crowd considering it had reached the midnight hour. This Friday sees the 'B' league doubles take place, which also counts towards the 'B' ranking points table and the main ranking competitions continue the following Friday with the Taylor cup. 180s were hit by: Brian Moar, Raymie Rendall, Gary Wilson, Ivan Leslie, Kevin Peace, Patty Sinclair, Jamie Marwick, Ian Eunson, Ian Munro, John Garson, Nicol Gray, Derrick Firth, Jak Kissick, Derek Firth, Erlend Ritch, Ryan Wilkie, Alan Gray, Stuart Thomson, Keith Brumpton (two), Hamish Baillie (two), Leigh Shearer (two), Robbie Stanger (two), Kevin Gray (two), Paul Foubister (three) and Brett Dickinson (four). Patty Sinclair, Paul Foubister and Ian Linklater also scored 177, whilst Ryan Wilkie had 174 and Ian Linklater 171. Ton plus checkouts were scored by: Allan Brown 100, Craig Taylor 101, Colin Kirkpatrick 102, Leigh Shearer 104, Stevie Moar 106, Stuart Thomson 112, Wayne Small 113, Michael Muir 113, Wayne Monkman 116, Neil Tait 120, Brett Dickinson 121, Stevie Linklater 126, Ian Linklater 130, Davy Henderson 136, Colin Barnett 151, Derek Firth 152, Karl Scott 157, Dennis Watt 119,130, Robbie Stanger 114, 130, 152 and 156. Additionally, Paul Foubister had checkouts of 106, 120 and 132 which were missed in last weeks report, apologies to him for that. Quoyburray 'B' 0, Legion 12; Bilco Boys 3, Wanderers 9; Untouchables 'A' 8, Legion Arrows 4; Warriors 4, Commodores 8; Untouchables 8, OGC 4; Nomads 3, Sanday 9. Exiles 8, Vikings 4; Sands 1, Tankerness 11; Quoyburray 9, Muppets 3; Sanday 'B' 5, Shapinsay 7; RBL2 4, Young Loons 8. Untouchables 'A' v Legion; Warriors v Wanderers; Untouchables v Legion Arrows; OGC v Commodores; Bilco Boys v Sanday; Nomads v Quoyburray 'B'. Sands v Tigers; Quoyburray v Vikings; Sanday 'B' v Tankerness; Shapinsay v Muppets; Exiles v Young Loons; RBL2 v Murray Arms. Leigh Shearer and Robert Stanger (right) beat Kevin Gray and Nicol Gray in the Kirkwall Legion doubles final. There were five father/son pairings entered in the doubles competition. Good for the future of Orkney darts! Week 13 of the Kirkwall and District Darts Leagues rolled past and it did indeed prove unlucky for some. Sanday found themselves tied 5-5 with the Legion, but just couldn't get over the winning line and lost out 7-5. Near the other end of the table it was the Legion Arrows who narrowly lost out in the last leg to the Bilco Boys, who in doing so have almost guaranteed themselves top flight participation for another season. Wanderers beat Quoyburray 'B' in bizarre fashion. Bizarre in that Wanderers Stewart Gray not only won all the matches he played but also hit a maximum! The Golf Club strolled to a victory over Warriors, whilst the Commodores and Untouchables sides had comfortable wins over Untouchables 'A' and Nomads respectively. There were quite a few close run matches in the second tier, none more so than Tigers and Young Loons sharing the points. The Sands boys are beginning to find their feet, only just losing out to the Muppets, as did Sanday 'B' in their defeat to RBL2. Murray Arms won away to the Vikings to keep their promotion hopes alive and, with leaders Exiles match v Tankerness postponed, Shapinsay kept within touching distance of them by beating Quoyburray 9-3. 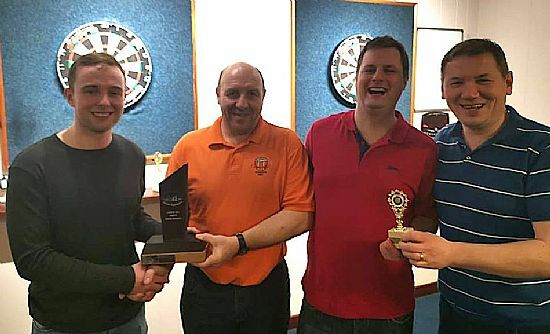 Quoyburray skipper Neil Tait lit up the 'B' league with a leg in which he suddenly thought he was MVG as it included both a 180 and a table topping 164 checkout. Reports are varied about the rest of the darts thrown in that leg, or indeed how many there were, but the highest finish of the season so far is worth praise in itself! This Friday sees the fifth of seven ranking competitions of the season take place in the Tankerness Hall as the Craigie Cup comes to town. With the 'B' league inter county competition now confirmed, it would be hoped to see an increased number of 'B' players in attendance as these main ranking points are added on to any 'B' points gained from the 'B' singles and doubles competitions, with the top 12 boys getting a place in the team to go to Shetland. The following Friday sees the 'B' League doubles take place in the Masonic. 180s this week were hit by: Stewart Gray, Ross Groundwater, Fraser Laird, Lee MacPherson, Derek Firth, Ian Findlay, Kevin Peace, Leigh Shearer, Trevor Shearer, Brett Dickinson, Gary Wilson, Ryan Wilkie, Stevie Garner, Steven Low, Keith Bain, Gary Drever, Jamie Marwick, Neil Tait, Don Gray, Kevin Gray (two), Stevie Linklater (two), Robbie Stanger (two), Alan Findlay (two) and Brian Stevenson (two). Raymie Rendall also scored 171. High checkouts were hit by: Jim Hamilton 100, Stevie Garner 100, Stevie Linklater 101, Jamie Marwick 104, Aaron Edwardson 106, Stuart Thomson 110, Trevor Shearer 111, Gary Wilson 113, Derek Firth 116, Brett Dickinson 116, Keith Brumpton 120, Ian Findlay 128, Ian Eunson 138, Brian Stevenson 151, Neil Tait 164 and Andrew Clouston 105, 106. Commodores 9, Untouchables 'A' 3; OGC 10, Warriors 2; Untouchables 9, Nomads 3. Tigers 6, Young Loons 6; Vikings 4, Murray Arms 8; Muppets 7, Sands 5; Shapinsay 9, Quoyburray 3; Sanday 'B' 5, RBL2 7. Legion v Bilco Boys; Wanderers v Untouchables 'A'; Legion Arrows v Warriors; Commodores v Untouchables; OGC v Nomads; Sanday v Quoyburray 'B'. Tigers v Exiles; Vikings v Sands; Tankerness v Quoyburray; Muppets v Sanday 'B'; Shapinsay v RBL2; Young Loons v Murray Arms. Stevie Linklater won the Kirkwall Legion singles beating Derek Firth in the final. Sports convener Duncan Cameron is pictured with them at the presentation. The leagues resumed last week and there were few signs of festive hangovers on show, with a lot on the scorecards in both leagues. The Legion resumed where they had finished, by winning big over the Nomads, whilst Commodores also demolished the Bilco Boys. A close match was expected between Untouchables 'A' and the Golf club, and so it proved, with the Golfers winning 8-4. The other Untouchables side beat Warriors by the same score in what looks by the scorecard like an exciting match. Ill health and weather disruption affected the other matches scheduled for the week. The 'B' league boys managed to fulfil all fixtures and two of the main promotion hopefuls both drew; Murray Arms with Tankerness and RBL2 with Tigers. Exiles romped to a victory over Muppets to extend their lead at the top, whilst Quoyburray and Shapinsay also had convincing wins over Sanday 'B' and Sands. The Young Loons rounded off the week with a comfortable result against the Vikings. Incidently, well done to all teams who played catch-up matches over the festive period, a great effort was produced in ensuring that the leagues were all caught up in time and is greatly appreciated. 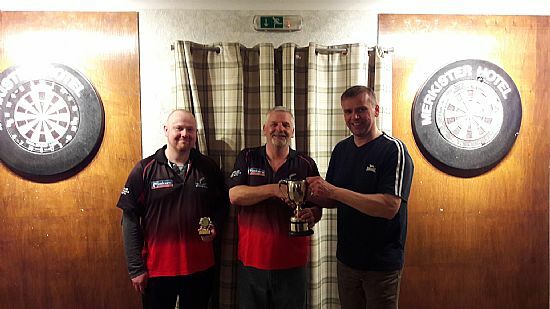 Not A KDDL competition, but very much supported by league players, the Kirkwall Legion Singles took place on Friday night, when Stevie Linklater beat Derek Firth in the final. The Legion Doubles takes place this Friday, before the resumption of the league ranking competitions the following week, with the annual KDDL outing to the Tankerness Hall for the Craigie Singles. 180s were hit by: Roy Foubister, Keith Brumpton, Andrew Moar, Robbie Stanger, Gary Wilson, Ian Findlay, Raymie Rendall, Ian Linklater, Davy Henderson, Aaron Edwardson, Robbie Norquoy, George Low, Connor Crawford, Alister Rendall, Gordon Rendall (OGC) (two), Stevie Moar (two) and Stevie Garner (two). Ian Linklater and John Garson both also scored 171. Ton+ checkouts were scored by: Stevie Linklater 100, Stevie Moar 100, Colin Ross 100, Derek Farmer 112, Keith Bain 113, Ian Linklater 116, Robert Hutchison 124, Jim Hamilton 124, Alister Rendall 124, Alan Findlay 154 and Brett Dickinson 120, 140. Nomads 0, Legion 12, Bilco Boys 2, Commodores 10, Untouchables 'A' 4, OGC 8, Warriors 4, Untouchables 8. RBL2 6, Tigers 6, Young Loons 8, Vikings 4, Murray Arms 6, Tankerness 6, Exiles 10, Muppets 2, Sands 3, Shapinsay 9, Quoyburray 10, Sanday 'B' 2. Warriors v Commodores, Untouchables v OGC, Nomads v Sanday. Murray Arms v Tigers, Exiles v Vikings, Sands v Tankerness, Quoyburray v Muppets, Sanday 'B' v Shapinsay, RBL2 v Young Loons. The second half of the season is up and running, although it may have been considered more of a canter, with only 5 teams turning up to compete in the Swanney Cup on Friday night for both 'A' and 'B' league teams. Disappointing but not altogether unexpected due to the scheduling problems, which saw it played only 3 days after New Year. Despite the numbers, it was an exciting enough competition, with the draw pitching the two 'B' teams in the same half as each other, guaranteeing 'B' league representation in the final, and it was the Tigers who came out on top beating Young Loons 3-1. The only preliminary match pitched the highest placed 'A' teams together, and the Golf Club turned over Wanderers 4-0. They proceeded to beat the Nomads in the semi-final. The gulf in class was not as apparent as it could have been, although the Golf Club eventually won 3-1, they were made to work for it. Steven Griffiths played steady darts all night and deserved his point in the final match-up of the cup. Stuart Thomson of Wanderers hit the only 180 of the competition. With plenty of keen young players in the hall, and not enough teams to warrant a plate competition, it was decided to have a money-in, money-out singles for fun along the same format as the cup. 17 of the 22 earlier participants entered, and it was Golf Club duo Stevie Linklater and Gordy Rendall who made the final, with Stevie just pinching it 2-1. Legion v Sanday, Wanderers v Quoyburray 'B', Legion Arrows v Bilco Boys,Commodores v Untouchables 'A', OGC v Warriors, Untouchables v Nomads. Tigers v Young Loons, Vikings v Murray Arms, Tankerness v Exiles, Muppets v Sands, Shapinsay v Quoyburray, Sanday 'B' v RBL2. League darts resume on Monday 7th, and 'B' captains please note that both the Exiles and Muppets have switched home venues away from the Orkney Hotel. The Exiles are now playing from the Masonic, with the Muppets switching to the Shore. Although non-KDDL, the much coveted Legion singles (for paid up Legion members only) take place on Friday 11th, with the Legion Doubles on Friday 18th. 180s were hit by: Brett Dickinson, Fraser Laird, Ian Munro, Sam Caithness, Karl Scott, Graham Rendall, Billy Ward (two), Leigh Shearer (three), Ian Eunson (three) and Robbie Stanger (four). Ton+ checkouts were scored by: Michael Muir 100, Paul Foubister 115, Derek Farmer 120, Brett Dickinson 156, Billy Ward 156, Graham Firth 111, 127, Jamie Marwick 100, 103, 107, Leigh Shearer 108, 110, 156, Robbie Stanger 111, 125 and 160. The Kirkwall and District Darts leagues, kindly sponsored by Williamsons Butchers, have now reached the halfway point. There has been a great response from teams in getting catch up games played over the past two weeks, and all outstanding matches have now been arranged to be played before the turn of the year. It is hard to accurately tell the story at the top of the 'A' league with annual challengers Commodores still to play five fixtures, but in any case, the Legion will be sitting top come the recommencement of play in 2019 as they have maximum points from the first 11 games. The league has settled into quite a few distinct groups. 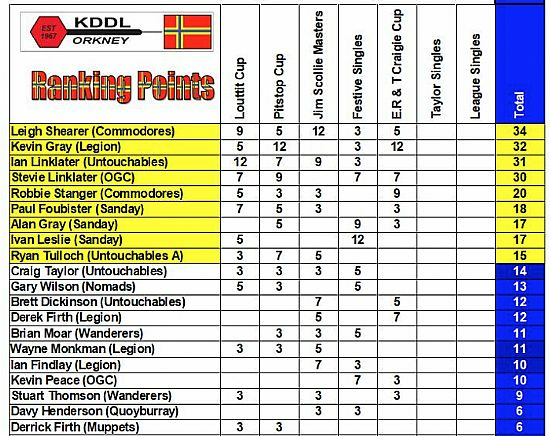 The title chasers Orkney Golf Club and Sanday will most likely be joined by the Commodores, with the Wanderers and both Untouchables teams fighting for the last two top half spots. The bottom five teams are all still possibilities for the drop, especially if the Arrows and Quoyburray 'B' start taking points of their nearest rivals in the second half, which is extremely possible. The 'B' league also has a few games yet to go, and leaders Exiles have full points from their 10 games. However, they have yet to play Shapinsay, who could put themselves in a great position hot on Exiles heels should they win that match. Murray Arms and RBL2 are still very much in the title/promotion race too at the midway point. The other teams in the top half will have differing views on their 17 points so far. Quoyburray, who were relegated from the 'A' league last season, must feel unlucky to be only mid table contenders, whilst the Young Loons are starting to reap the benefits of a couple of years experience and should be pleased with their haul of points thus far. The Vikings and Sands occupy the bottom positions, but they will be hoping to start picking up more points in the second half of the season and are more than capable of doing so. The results of all matches yet to be played will be posted in the first report of 2019. The first of the KDDL cups of 2019 is Friday, January 4, with the Swanney Cup which is for A and B teams. The leagues then begin from January 7 onwards. 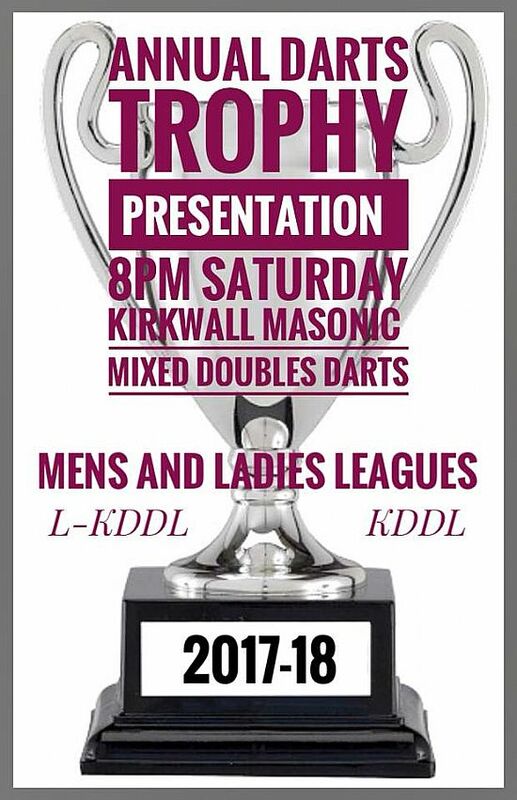 Not KDDL competitions, but popular with league players who are Kirkwall Legion members, is the Legion Singles on Friday, January 11, and doubles on January 18. The next ranking competition is the Craigie Cup in the Tankerness Hall on Friday January 25. On behalf of the KDDL committee, we would like to wish all players, sponsors, friends and followers of our leagues a Merry Christmas and a very Happy New Year. 180s were hit by: Brian Moar, Derek Firth, Ryan Tulloch, Trevor Shearer, Jim Hamilton, Craig Taylor, Gary Wilson, Logan Peace, Jamie Drever, Robbie Norquoy, Davy Henderson, Darryl Robertson, Dennis Watt, Erlend Ritch, Don Wilson, Graham Firth (two), Alan Gray (two) and Kevin Gray (four). Karl Scott had a 177. Ton+ checkouts were scored by: Gordon Rendall (SB) 100, Ivan Leslie 110, Stevie Moar 128, Keith Bain 128, Alan Gray 130, Brian Moar 143, Stevie Linklater 150, Brian Murray 158, Robert Hutchison 100, 132, 133 and Jamie Drever 110, 128, and 160. Legion 10, Wanderers 2; Sanday 10, Legion Arrows 2; Bilco Boys 3, OGC 9; Untouchables 'A' 6, Untouchables 6; Warriors 10, Nomads 2; Bilco Boys 0, Legion 12. Tigers 10, Vikings 2; Young Loons 8, Tankerness 4; Murray Arms 9, Muppets 3; Sands 4, Sanday 'B' 8; Quoyburray 5, RBL2 7; Tankerness 4, Murray Arms 8; Sanday 'B' 4, Exiles 8. 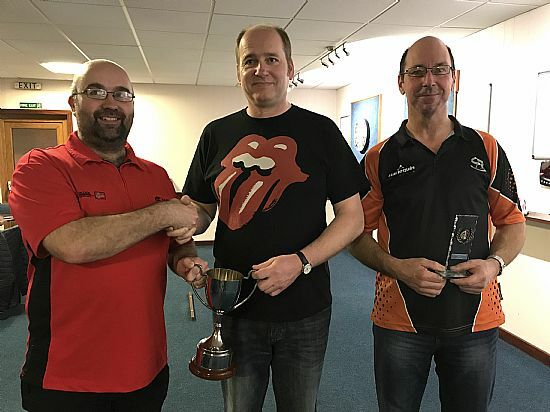 Iavn Leslie beat Alan Gray in the Festive Singles final. Friday night saw this season's ranking points competitions reach the halfway stage with the Festive Open Singles played in the Masonic. Annually the biggest of the ranking competitions, this year was no exception with 61 players taking part, ensuring it would be a long night of darts. Whilst there are certainly no easy draws nowadays, the bottom half of the draw seemed to be stacked with big guns and inevitably some had to give way early on. Trevor Shearer had been in sparkling form earlier in the week, and he squeezed past Kevin Gray on his way to the quarters, where Ivan Leslie proved too strong for him. Likewise Gary Wilson picked up another valuable 5 points as he reached the quarters, but could not get the better of Stevie Linklater. In the top half, all eyes were on Tigers new signing Stevie Garner, who had put in an impressive debut in midweek and he did not disappoint, beating Wayne Monkman and then Nicol Gray, before being pipped by two ton-plus finishes by Brian Moar. However, Brian's doubling ability completely deserted him in his quarter-final showdown with Alan Gray. Craig Taylor has been quietly picking up points in ranking competitions this season, but announced his intention to mix it with the top boys by beating Leigh Shearer, before also falling victim to the deadly double-itis against Kevin Peace in the quarters by a 3-2 scoreline. Into the semi-finals, and it was Kevin Peace who struggled to slot into the doubles, allowing the calm and steady Alan Gray to make it to his first ever ranking final with a 4-1 win. There was some power scoring on show in the second semi-final, with a few chances which went begging as Ivan beat Stevie Linklater 4-2. The final saw the two Sanday team-mates lock horns, and it was an entertaining final to watch. Alan resolutely went about his game, playing his best darts of the night. But Ivan was in sensational scoring form and took any chances that came his way. Alan went 2-1 up thanks to a 180 then 119 finish to the leg, but then Ivan hit top gear, stealing back with a 14 darter. Despite Alan having a couple of darts at a double, he was facing an onslaught of 140s and Ivan nearly checked the final leg with a 164 finish, but he made no mistake in tidying up with his next throw. Ivan left with the trophy, and £100 first prize but Alan left with almost as big a smile and £50 prizemoney, delighted with his achievements and proving that despite the oncoming tide of young talent in the leagues, there is still life in a few old dogs yet! The annual big festive drinks raffle also took place on the night. Top prize went to Brian Stevenson Snr, with Gray Norquoy 2nd prize winner. There were also various others prizes given out to numerous other winners. Thanks to all who bought and sold tickets in what is a major annual fundraiser for the KDDL. 180s were hit by: Alan Findlay, Trevor Shearer, Graham Firth, Ian Linklater, Ivan Rendall, Colin Ross, Daniel Nicol, Toby Penwarden, Derek Firth, Leigh Shearer, Steve Garner, Keith Brumpton, Ian Findlay, Kevin Gray, Stevie Linklater, Alan Gray, Ryan Tulloch (two), Gary Wilson (two), Davy Henderson (two) and Jamie Marwick (two). Jim Hamilton and Jamie Marwick both scored 174. Ton+ checkouts were scored by: Alan Findlay 100, Andrew Clouston 101, Ryan Tulloch 102, Ian Findlay 102, Neil Tait 103, Jamie Drever 106, Davy Henderson 106, Erlend Lennie 114, Wayne Monkman 126, Garry Peace 127, Jason Cook 127, Colin Leslie 131, Simon Parry 157, Steve Garner 160, Kevin Gray 160, Trevor Shearer 100 and 106, Ian Eunson 101 and 120, Brian Moar 109 and 115 and Alan Gray 119 and 144. Legion Arrows 2, Legion 10 ; Nomads 4, Wanderers 8; OGC 11, QBB 1; Untouchables 9, Bilco Boys 3; Warriors 3, Untouchables 'A' 9; Untouchables 'A' 7, Wanderers 5. Tankerness 3, Tigers 9; Muppets 4, Young Loons 8; Shapinsay 6, Murray Arms 6; Quoyburray 10, Sands 2; Vikings 1, Quoyburray 11. Ivan Leslie 5, Alan Gray 2. The first of the 'B' league ranking events took place on Friday with 26 players entering the Albyn Video Games Singles. Erlend Ritch was one of the hot favourites and he booked a semi-final tie with Toby Penwarden following a win over the ever-improving Jason Cook. Toby took a leg off Erlend but the Exiles man was able to put himself through to the final. In the bottom half of the draw, Jamie Drever had battled through a tough draw and resoundingly beat Derek Farmer 4-0 in the other semi. The final was streamed worldwide by the wonders of Facebook, and it appeared to be a very good final. There were plenty of big scores and pressure finishes but in the end Jamie emerged triumphant with a 5-2 win, adding yet another 'B' ranking singles title to his two previous 'B' league singles triumphs. The Legion's bid for yet another 'A' League title gathered huge momentum this week with them beating Commodores, then watching nearest challengers Sanday and Golf Club draw with each other. Sanday's challenge faltered further later in the week with a narrow defeat to Untouchables, whilst Commodores remain poised to potentially leapfrog the other two following a nail biting win over Wanderers. The Bilco Boys move into double figures for the season after a very good win over struggling Warriors, whilst fellow relegation battlers Arrows and Nomads both lost out to Wanderers and Untouchables 'A' respectively. Quoyburray 'B' remain pointless but signs of improvement are definitely there as they took 3 games off in-form Untouchables. The Exiles remain on maximum points in the 'B' league following two big wins this week, and are followed in second place by Shapinsay who overcame Young Loons. Sands had a tough week playing two of the title contenders but they will be looking for points in the next few games to try and lift from bottom spot. Murray Arms retained their place amongst the four promotion hopefuls with a win over Sanday 'B', whilst mid table candidates Muppets and Tankerness both took three points from their matches. This Friday sees the Masonic host the final ranking event of the first half, the festive open singles. It's usually a really enjoyable night and the KDDL committee will be doing the famous festive prize draw towards the end of the night. Players are requested to please remember to return all tickets and money to the committee before the draw. 180s were hit by: Wayne Monkman, Billy Ward, Freddie Tait, Simon Parry, Brian Moar, Stevie Linklater, Trevor Shearer, Erlend Lennie, Alan Gray, Archie Yule, Erlend Eunson, Derek Farmer, Nicol Gray, Davy Henderson, Ian Linklater (two), Brett Dickinson (two), Paul Foubister (two), Martin Peace (two), Darryl Robertson (two), Erlend Ritch (two), Robbie Stanger (three), Robbie Norquoy (three) and Kevin Sarling (three). Brian Moar also scored 177 whilst John Thomson scored 171. Ton plus checkouts were scored by: Brian Stevenson 100, Derrick Firth 100, Simon Parry 103, Karl Scott 107, Jamie Drever 109, Craig Moar 110, Erlend Ritch 111, Ian Munro 111, Graham Firth 112, Trevor Shearer 134, Robbie Stanger 135, Ian Linklater 155, Brett Dickinson 100 & 102, Erlend Lennie 100 & 119 and Don Wilson 110, 120 & 136. Legion 9, Commodores 3, Wanderers 7, Legion Arrows 5, Sanday 6, OGC 6, Quoyburray 'B' 3, Untouchables 9, Bilco Boys 8, Warriors 4, Untouchables 'A' 9, Nomads 3, Commodores 7, Wanderers 5, Untouchables 7, Sanday 5. Tigers 5, Muppets 7, Vikings 3, Tankerness 9, Young Loons 4, Shapinsay 8, Murray Arms 9, Sanday 'B' 3, Exiles 9, Quoyburray 3, Sands 0, RBL2 12, Sands 0, Exiles 12. Legion v Wanderers, Sanday v Legion Arrows, Quoyburray 'B' v Commodores, Bilco Boys v OGC, Untouchables 'A' v Untouchables, Warriors v Nomads. 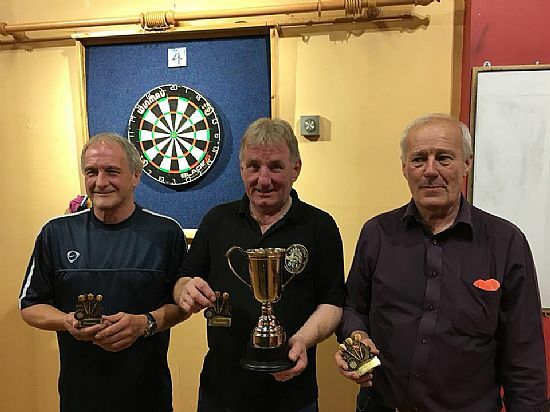 The Jim Scollie Masters took place in the Legion last Friday, the first since the darts legend, more affectionately known as Tattie Bogle, had passed away. It's safe to assume he would have thoroughly approved of the darts on show, with sub-15 dart legs aplenty and none more so than in Wayne Monkman's 3-1 win over Brian Moar in their last 16 tie, with the first three legs all being 14 darts or less. Brett Dickinson finally got points on the ranking table and did so in style by reaching the semi-final, where Leigh Shearer was just too steady for him. In the top half of the draw Ian Findlay had made good progress, but this was also halted at the semi-final stage by Ian Linklater. There are arguably few players in better form in the KDDL at present, and this was the second trophy shootout between these pair in the three competitions held thus far. Ian came away victorious in the Louttit Singles, but it was Leigh who would be grinning at the end of this cup. Both players threw some steady darts, with Ian posting two 180s, but it was Leigh's cool finishing coupled with some sublime setup shots that proved to be the winning formula. Great to see a new face winning a ranking event, and Leigh becomes only the 15th singles winner since the Ranking system was introduced in the 2007-8 season. This Friday sees the first of the 'B' league singles ranking cups, the Albyn Video Games singles, which adds points on to their main ranking points tally in order to pick the 'B' teams for their representative matches. Then on Friday December 9, its the final Ranking event of 2018, the Festive Singles, where our big prize draw raffle will be drawn. Can all players please start returning tickets (sold and unsold) plus money to David Henderson at the Bank of Scotland as soon as possible please. 180s were hit by: Gordon Rendall (OGC), Ian Findlay, Roy Foubister, Jason Cook, Steven Low, Keith Bain, Graham Rendall, Steven Griffiths, Jak Kissick, Ian Munro, Darryl Robertson, Neil Drever, Derek Farmer, Pattie Sinclair, Brett Dickinson (two), Kevin Gray (two), Andrew Moar (two), Paul Foubister (two), Graham Firth (three), Ryan Tulloch (three) and Ian Linklater (three). Wayne Monkman scored 177. Ton plus checkouts were scored by: Graham Firth 100, Robbie Stanger 100, Paul Foubister 102, Neil Drever 106, Alan Gray 106, Graham Rendall 108, Raymie Rendall 109, Nicol Gray 112, Leigh Shearer 112, Brian Murray 116, Neil Tait 117, Kevin Gray 118, Erlend Eunson 120, Ryan Tulloch 137, Ian Linklater 160 and Brett Dickinson 106 & 116. OGC 7, Untouchables 5, OGC 5, Legion 7, Nomads 9, Legion Arrows 3, Warriors 9, Quoyburray 'B' 3, Untouchables 'A' 10, Bilco Boys 2. Young Loons 7, Quoyburray 5, Shapinsay 8, Tigers 4, Muppets 6, Vikings 6, RBL2 11, Tankerness 1, Sanday 'B' 3, Young Loons 9, Quoyburray 4, Murray Arms 8. Untouchables v Bilco Boys, Warriors v Untouchables 'A'. Sanday 'B' v Exiles, Quoyburray v Sands. Legion 10, Untouchables 2, Wanderers 2, OGC 10, Sanday 9, Warriors 3, QBB 3, Untouchables 'A' 9, Bilco Boys 6, Nomads 6. Murray Arms 9, Sands 3, Exiles 9, RBL2 3. Jim Scollie Masters (Ranking), Legion, names by 7.30pm. Albyn Video Games Singles ('B' Ranking), Legion, names by 7.30pm. Legion v Commodores, Wanderers v Legion Arrows, Sanday v OGC, Quoyburray 'B' v Untouchables, Bilco Boys v Warriors, Untouchables 'A' v Nomads. Tigers v Muppets, Vikings v Tankerness, Young Loons v Shapinsay, Murray Arms v Sanday 'B', Exiles v Quoyburray, Sands v RBL2. 180s were hit by: Kevin Gray, Wayne Monkman, Ian Linklater, Aaron Mitchell, Stevie Linklater, Gordon Rendall (OGC), Colin Barnett, Erlend Lennie, Pattie Sinclair, Sam Caithness, Colin Leslie, Ian Eunson, George Low, Colin Findlay, Keith Bain, Derek Ward, Erlend Ritch, Kevin Sarling, Neil Drever, Darryl Robertson, Derek Firth (two), Alan Gray (two), Gary Wilson (two), Gordon Rendall (SB) (two), Dennis Watt (two) and Brian Murray (two). Ton plus checkouts were scored by: Kevin Gray 100, Kevin Sarling 100, Wayne Small 101, Colin Leslie 102, Don Wilson 102, Jamie Drever 104, Stevie Moar 111, Fraser Laird 112, Robbie Norquoy 114, Derek Firth 120, Keith Bain 122, Ian Linklater 150 and Ivan Leslie 100 & 104. Kevin Gray, right, beat Stevie Linklater in the Pit Stop Cup Final. With a quarter of the league matches completed in the KDDL schedule, the leagues are beginning to take shape. In the 'A' league, the top four teams most would have predicted all had good wins and now occupy the top slots. Below them, Wanderers fought back to share the points with Untouchables and Bilco Boys had a crucial win down in the depths of the league against Quoyburray 'B'. In the 'B' league the two new entries this year, Exiles and RBL2, occupy the first two positions, with the two relegated teams from last year, Shapinsay and Quoyburray, in third and fourth respectively. Sands and Young Loons played out a stalemate, whilst Sanday 'B' scraped past the Vikings. The second of this years ranking points events took place on Friday in the Orkney Golf Club, attracting a decent entry of 40 players. As usual with so many entries, there were some mouthwatering early ties, with some big names falling early on. The semi-final line-up included some familiar names, with Kevin Gray beating Ian Linklater 4-1, and Stevie Linklater beating Ryan Tulloch without reply. It was fitting that the best two players on the night contested the final, and what a final it was. Kevin raced into a two leg lead, courtesy of back to back 15 darters which included a 156 finish. Stevie pegged back the third leg before Kevin took the fourth. At this stage the averages were almost TV standard, with Kevin on 103 and Stevie on a very respectable 80. Missed doubles from Kevin and a resurgence from Stevie, saw the scores level again at three all and it really was anybody's match at this point. The darts became a little nervy as Kevin pinched the seventh leg. Then a narrowly missed dart from Stevie at double 16 on a big finish left Kevin to mop up double tops, which he did with aplomb. A great final for the spectator, with final of averages of 77.96 (Kevin) and 75.82 (Stevie) only dipping at the end as the finishing line came in view. Stevie Moar, Ian Findlay, Neil Croy, Simon Parry, Brian Moar, Allan Brown, Billy Ward, Keith Brumpton, Trevor Shearer, Ivan Leslie, Erlend Eunson, Alistair Rendall, Kevin Sarling, Andy Green, Alan Gray, Keith Bain, Wayne Monkman (two), Jim Brown (two), Dennis Watt (two), Graham Firth (two), Robbie Stanger (two), Ryan Tulloch (two), Kevin Gray (four) and Leigh Shearer (four). Robbie Norquoy scored 174, while Ian Linklater scored 177. Gary Wilson 100, Ryan Wilkie 100, Colin Kirkpatrick 100, Trevor Shearer 106, Dennis Watt 106, Wilfie Tulloch 106, Alan Gray 106, Aaron Mitchell 107, Craig Taylor 107, Jamie Drever 110, Ivan Leslie 112, Simon Parry 113, Robbie Norquoy 140, Robbie Stanger 141, Jim Brown (104 & 116), Paul Foubister (112 & 117), Leigh Shearer (127 & 155), Brett Dickinson (106, 114 & 130) and Kevin Gray (106, 110, 120 & 156). Shapinsay v Tigers, Muppets v Vikings, RBL2 v Tankerness, Sanday 'B' v Young Loons, Quoyburray v Murray Arms, Sands v Exiles. Stevie Linklater won the Davie Cooper Cup beating defending Kevin Gray 4-3 in the closest of finals, which took place in the Kirkwall Masonic on Saturday. Almost 50 players entered the charity competition which raised approx £900, to be split between the Fishermen’s Mission and RNLI. The KDDL will make it up to £1000. Money was raised through high score fun boards, a coin push, football cards and a raffle. League president Craig Taylor gave a huge thanks to everyone for the generous support and donations which made the day such a success. Quite a busy week just passed in the KDDL and another great example of the ever improving standard. Between league and cup matches there were 49 180s, with almost half being hit by 'B' league players! The two crunch games in the top tier saw Legion narrowly defeat Untouchables 'A' while Commodores put 8 past the Golf Club, who themselves beat Nomads on Friday night. Nomads also had a crucial win over Quoyburray 'B', while there were big wins for Wanderers, Untouchables and Sanday. The Exiles look a cut above the rest as they maintained their winning streak in the 'B' league, whilst Tigers, Muppets, Shapinsay and RBL2 all recorded wins. Tankerness were held to a draw with Sanday 'B' in something of a shock result. Ton plus checkouts were scored by: Darryl Robertson 110, Jason Cook 110, Colin Kirkpatrick 118, Kevin Gray 120, Garry Peace 120, Jamie Drever 126, Erlend Lennie 160, Stevie Linklater 100 & 102, Simon Parry 100 & 108, Paul Foubister 100 & 112, Kevin Peace 105 & 115, Wayne Monkman 108 & 109, Ian Linklater 112 & 120 and Dennis Watt 101, 110 & 137. Legion 7, Untouchables 'A' 5, Wanderers 10, Warriors 2, Legion Arrows 1, Untouchables 11, Commodores 8, OGC 4, Sanday 11, Bilco Boys 1, QBB 3, Nomads 9, Nomads 2, OGC 10. Tigers 8, Sands 4, Tankerness 6, Sanday 'B' 6, Muppets 3, Shapinsay 9, Young Loons 2, Exiles 10, Murray Arms 5, RBL2 7. Friday November 9: Pitstop Singles (Ranking) Orkney Golf Club, names by 7.30pm. Legion v Untouchables, Wanderers v OGC, Legion Arrows v Commodores, Sanday v Warriors, QBB v Untouchables 'A', Bilco Boys v Nomads. Tigers v Sanday 'B', Vikings v Shapinsay, Tankerness v Muppets, Young Loons v Quoyburray, Murray Arms v Sands, Exiles v RBL2. Well done Gary Wilson who beat Steven Linklater in the Tom Notman cup final. League secretary Brian Moar is pictured presenting the trophies. It was a week of 301 cups in the KDDL this week. 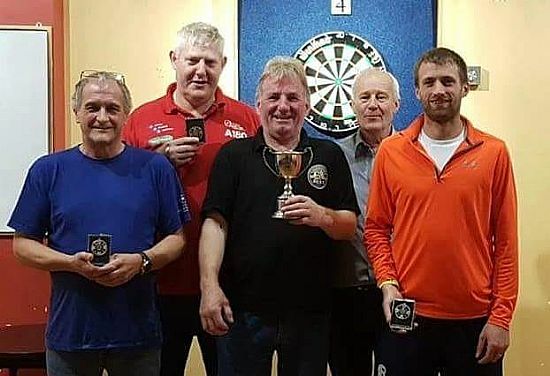 On Monday, the ‘A’ League 301 Challenge Cup, which was won by the Untouchables, took place in the Legion, beating the Commodores 4-0 in the final. On Tuesday, the ‘B’ League 301 Cup was held in the Masonic. In a very close final, the Nomads took the title with a 4-3 win over the Vikings. 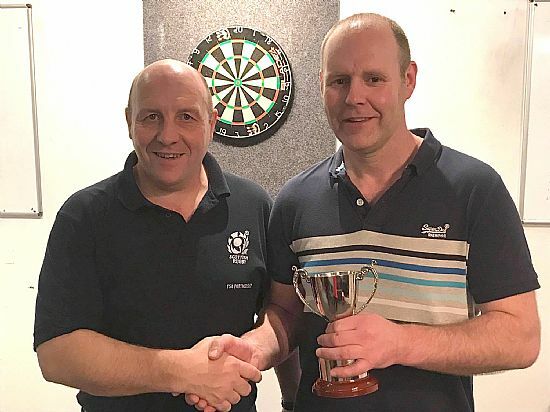 The Tom Notman Memorial Singles took place back in the Kirkwall Legion on Friday night, with Martin Peace beating Paul Firth 2-1 in a very close final. Tom was a very much respected founding member of the KDDL, serving as president and secretary over the years. Despite having the week off for cup games, a couple of previously postponed league games took place. In the Williamsons Butchers ‘A’ League, the Untouchables ‘A’ moved into the top half of the table, with a resounding 9-3 victory over Shapinsay. Tankerness moved into pole position in the Williamsons Butchers ‘B’ League, inspired by in-form captain Robbie Norquoy gobbling up another brace of 180s as they narrowly defeated the Vikings 7-5. 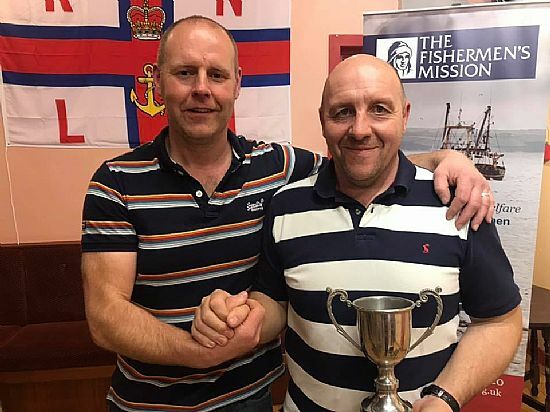 The Davy Cooper Singles takes place this Saturday afternoon in the Masonic, with all money raised donated evenly between the RNLI and Fishermen’s Mission. Names by 1.30pm. Donations for the raffle etc are very welcome, please take them along on the day or contact Craig Taylor on 07802 440068. Then, next Friday evening sees the second of our ranking competitions, the Pitstop Cup, take place in the Orkney Golf Club. 180s this week were hit by: Jamie Marwick, Colin Barnett, Gary Wilson, Trevor Shearer (two) and Robbie Norquoy (two). Ton-plus checkouts came from: Derek Manson 100, Brett Dickinson 101, Alistair Rendall 101, Neil Drever 105, Mark Shearer 110, Freddie Tait 110, Ian Linklater 113 and Robbie Stanger 125 and 101. ‘A’ League — Shapinsay 3, Untouchables ‘A’ 9. ‘B’ League — Tankerness 7, Vikings 5. Monday, November 6 — ‘A’ League — Commodores v Untouchables; Quoyburray v Warriors; Quoyburray ‘B’ v Legion; Sanday v Shapinsay; Legion Arrows v OGC; Wanderers v Untouchables ‘A’. ‘B’ League — Young Loons v Sanday ‘B’; Sands v Streamline; Nomads v Vikings; Bilco Boys v Murray Arms; Tankerness v Ale Stars; Muppets – no game. Another week over in the KDDL Leagues, kindly sponsored by Williamsons Butchers, and another display of big hitting across the board. The Legion continued their winning streak against Quoyburray 'B', whilst the Wanderers move into second following a ground out win against the slightly unfortunate Bilco Boys. The Golf Club v Untouchables match was postponed, giving Sanday and Commodores the chance to move equal on points with the Golf Club, which they both did. Indeed the Sanday game against Nomads produced some of the most notable scores of the week, including a 12 dart leg from Ivan Leslie and an 11-darter from Paul Foubister. Untouchables 'A' finally got their first points of the season with a win over Arrows. The scorecard of the week was found in the 'B' league, with multiple 180s and high finishes in the Exiles thumping of the Vikings. RBL2 remain the only other side still on maximum points from the first three games, but they were pushed all the way by the Young Loons. The Sands finally played their first game of the season but lost out to Muppets, followed the next night by a loss to Tankerness. The Muppets in turn lost out to Quoyburray on Tuesday as they maintain their unbeaten start to the season. Shapinsay look like they will be up for a title push this season, brushing aside Sanday 'B', while over in the Legion the Tigers slipped up against the ever dangerous Murray Arms boys. Tomorrow night (Friday) sees the Tom Notman Singles taking place in the Legion, names by 7.30pm. Tom was another founder member of the league and played an important role in the early development of the KDDL. The format is the old league format; 301 double start, best of three legs, and bull-up, mugs away and bull-up the order of play. 180s were hit by: Ivan Leslie, Michael Muir, Graham Firth, Gary Norquoy, Gavin Linklater, Robbie Norquoy, Connor Crawford, Nicol Gray, Jamie Marwick, Gordon Rendall (SB), Ian Munro, Erlend Ritch, Brian Stevenson, Jamie Drever, Paul Foubister (two), Kevin Gray (two), Billy Ward (two), Kevin Sarling (two) and Dennis Watt (four). Tigers 3, Murray Arms 9, Vikings 1, Exiles 11, Tankerness 8, Sands 4, Muppets 4, Quoyburray 8, Shapinsay 10, Sanday 'B' 2, Young Loons 5, RBL2 7. Young Loons v Exiles, Murray Arms v RBL2. 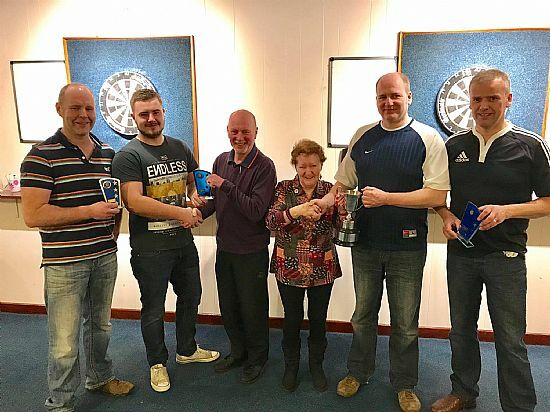 Pictured at the Loutitt Singles presentation are, KDDL committee member Brett Dickinson, runner-up Leigh Shearer, winner Ian Linklater and KDDL president Craig Taylor. 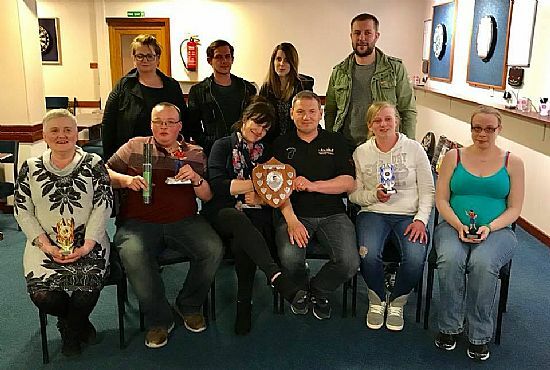 The first of the ranking points competitions of the year to gain qualification for the teams to play Shetland and the West was held in the Kirkwall legion on Friday night. 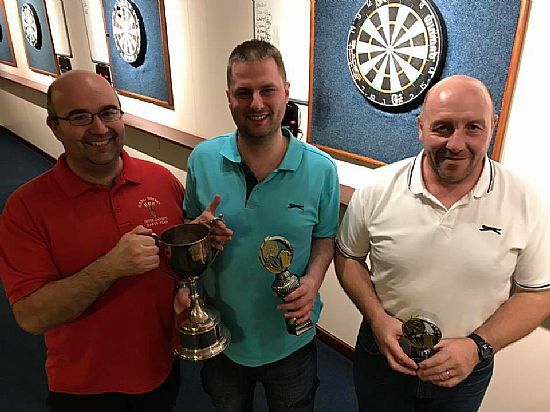 The Loutitt Singles attracted 44 entries, and some great darts were thrown on the night, with the odd shock results during the event to shake things up. On to the semi-finals, Ian Linklater beat Paul Foubister in the first semi, with Leigh Shearer beating Stevie Linklater in the other. The final saw Ian run out winner 5-1 against Leigh, finally winning the trophy, having being in the final for the last four years. What a week that was in the Williamsons Butchers KDDL leagues! With 47 180s hit across league and cup fixtures its safe to say the players are beginning to find their range. A lot of close games in the 'A' league, most notably with the Bilco Boys picking up their first ever top flight points, and the Legion just pipping Sanday. Wanderers travelled to the Tankerness Hall and managed to achieve their first ever whitewash, just getting the better of a despondent Quoyburray 'B'. Down in the 'B' league, new boys Exiles trounced Tankerness, as did Murray Arms over the Vikings. The teams that both dropped down last year could only draw with each other, and the Young Loons picked up points against an experienced Tigers side. Untouchables 'A' 4, Commodores 8, Warriors 5, OGC 7, Nomads 5, Untouchables 7. Quoyburray 6, Shapinsay 6, RBL2 9, Sanday 'B' 3. 180s were hit by: Robert Hutchison, Kevin Peace, Alan Findlay, Robbie Stanger, Jamie Drever, Derek Ward, Steven Low, Nicol Gray, Brian Stevenson, Gordon Rendall (SB), George Low, Craig Taylor, Simon Parry, Ian Linklater, Stevie Linklater, Mark Shearer (2), Billy Ward (2), Ian Munro (2), Darryl Robertson (2), Gary Wilson (2), Erlend Lennie (3), Ivan Leslie (3), Erlend Ritch (3), Paul Foubister (4), Leigh Shearer (4) and Kevin Gray (5). Bilco Boys v Legion, Untouchables 'A' v Wanderers, Warriors v Legion Arrows, Untouchables v Commodores, Nomads v OGC, Quoyburray 'B' v Sanday. RBL2 v Shapinsay, Murray Arms v Young Loons. The leagues are finally up and running, and right from the off the top two from last year hit the top of the table. Legion took 11 games from newly promoted Nomads, while the Golf Club had an impressive 11-1 win over the dangerous Untouchables 'A'. The Arrows find themselves in the lofty heights of third place following a big win over Quoyburray 'B' and Sanday just nicked all three points from their clash with the Wanderers. A share of the spoils was to be had between Untouchables and Warriors, a result which neither team would really have wanted to kick-start their season. The Exiles took no time in taking pole position in the 'B' league, demolishing the Muppets en route. The Young Loons look to have built on the last two years of experience and had a good win over the Vikings to take second spot. RBL2 were just a little too clinical for the Tigers, while Quoyburray won by the narrowest of margins over Sanday 'B'. Friday sees the first of this season's ranking points competitions, the Louttit Cup, take place in the Legion. Competition for a place in the sides to face the West and Shetland near the end of the season is expected to be fiercer than previously, with an ever more dangerous group of youngsters emerging, as well as some new but experienced faces having joined the league. It should be an interesting night of darts. 180s were hit by: Stuart Thomson, Kevin Gray, Ian Findlay, Colin Barnett, Jason Cook, Steven Griffiths, Neil Drever, Gordon Rendall (SB), Patty Sinclair, David Henderson, Derek Farmer (two), Ian Linklater (two) and Brett Dickinson (two). Ton plus checkouts were scored by: Ivan Leslie 104, Gordon Rendall (OGC) 104, Brian Moar 106, Kevin Gray 107, Ben Hogan 107, Ross Groundwater 112, Kevin Sarling 101 & 113 and Stevie Linklater 106 & 116. OGC 11, Untouchables 'A' 1, Untouchables 6, Warriors 6. Tigers 4, RBL2 8, Vikings 3, Young Loons 9, Muppets 1, Exiles 11, Sanday 'B' 5, Quoyburray 7. Commodores v Warriors, OGC v Untouchables, Sanday v Nomads. Shapinsay v Sanday 'B', Young Loons v RBL2. Jimmy Miller memorial Cup winner Jim Brown (left), Eoin Miller and Kevin Peace (right). THE 301 double start cups came into play last week and it was obvious that the rustiness of the previous few weeks were starting to disappear, with high scoring and big finishing appearing in abundance. The 'A' league teams got underway on Monday and there were a lot of games going the distance. Untouchables 'A' reached the final, but narrowly lost in the deciding team leg to Sanday, who had survived going the distance in every match they played that night. On Tuesday the 'B' boys got their eye in and it was once more the RBL2 team who reigned supreme, beating Shapinsay 4-1 in the final. Then on Friday, it was the much anticipated Jimmy Miller Memorial Cup. 53 players, including several non-registered players plus some of Jimmy's family took part, and it was every bit the fun night of darts Jimmy would have hoped for. A real family tie was drawn in the first round with Jimmy's son Eoin losing out to Jimmy's grandson George. Always quick to praise and encourage the younger players, he would surely have been delighted to see other grandson Steven reach the last 16, along with fellow youngsters Alan Findlay, Jason Cook and Nicol Gray. That was as far as they would get however. Neil Croy was the last of his old team-mates to bow out, narrowly losing to Kevin Peace in the semi, as did Jamie Marwick to Jim Brown in the other. The final was watched by a packed Legion bar, and Jim Brown just proved the more consistent of the pair as he eventually sunk the double to win the cup 4-2 and become the first name on it, an achievement he said he was immensely proud of. No cup game this Friday, however, the following Friday, October 12, sees the first ranking points competition of the season, with the Louttit Cup being played for in the Legion as players begin their quest to qualify for the team to take on Shetland next April. 180s were hit by: Alan Findlay, Andrew Green, Jim Brown, Kevin Peace (two), Kevin Gray (two) and Brian Moar (two). Ton plus checkouts were scored by: Keith Brumpton 100, Craig Taylor 100, Kevin Sarling 105, Jim Brown 106, Neil Croy 108, Nicol Gray 110, Ian Findlay 111, Trevor Shearer 118 and Stevie Linklater 141. Sanday v Legion, Quoyburray 'B' v Wanderers, Bilco Boys v Legion Arrows, Untouchables 'A' v Commodores, Warriors v OGC, Nomads v Untouchables. Young Loons v Tigers, Murray Arms v Vikings, Exiles v Tankerness, Sands v Muppets, Quoyburray v Shapinsay, RBL2 v Sanday 'B'. Cricket doubles runners-up, Ben Hogan and Craig Taylor, with winners Kevin Gray and Derek Firth. Kevin also won the singles, with Derek runner-up. RBL2, Foubister Cup winners. From left, Neil Drever, Brian Murray and John Craigie. Legion, Lynnfield Cup winners. From left, Derek Firth, Ian Findlay, Neil Croy and Kevin Gray. As the new league season gets ever closer, last week saw the cricket version of darts take the fore. The 'A' league boys bulled up on Monday in the Lynnfield Cup, and in their first appearance of the season, it was defending league champions the Legion who came away with the silverware, beating Sanday in the final. The following night RBL2 triumphed in the final of the Foubister cup by defeating Quoyburray. Kevin Gray won the cricket singles on Friday night, beating Derek Firth 2-0 in the final. They then combined forces to beat Craig Taylor and Ben Hogan in the doubles final by the same score. With the players now starting to find their range at last after the summer layoff, there were several 180s scored, and Kevin Gray and Brian Moar both managed the rare feat of hitting three bulls in one throw. On Friday, the inaugural Jimmy Miller Memorial open singles takes place in the Kirkwall Legion in memory of the darts legend and absolute gentleman who we very sadly lost earlier this year. Jimmy was a founding committee member of the KDDL, past president, honorary president, and the only man to play every year for the 50 year existence of the league, winning numerous titles along the way. This is open to all players and not restricted to KDDL members, with the cup very kindly donated to the league by Jimmy’s family. Ryan Wilkie, Craig Taylor, Ivan Leslie, Jim Brown, Derek Firth and Kevin Gray (two). Shapinsay v Sands, Sanday 'B' v Quoyburray. 17 September 2018Second silverware for OGC. Orkney Golf Club won the Spiers Cup. From left, Kevin Peace, Gordon Rendall, Keith Brumpton and Stevie Linklater. THE first of the A and B combined cups, the Spiers Cup, took place last Monday in the Kirkwall Masonic. With the longer team format, and a pretty good entry of 12 teams it dragged on until close to midnight. Nevertheless, there were some good darts on show and some good performances from the B lads. One of those B teams managed to nip through to the final, but Shapinsay were just narrowly outgunned by the Orkney Golf Club, who have now won the first two cups of the season and certainly seem to be up for the title challenge this year. This Friday sees the Legion play host to the Cricket Singles and Doubles competitions. Stevie Linklater will no doubt be eager to retain the singles title he claimed last time around, while Brian Moar and Stuart Thomson will be hoping to do likewise in the doubles. The 301 double start cups take place on Monday and Tuesday next week. While next Friday sees the inaugural Jimmy Miller Open Singles Cup held in the Legion, generously donated by the Miller family. 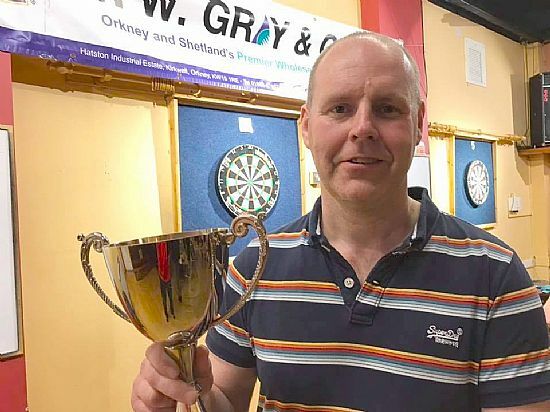 Jimmy was a huge character in his 50 years participation in the local darts scene and it will no doubt become a much sought after title amongst the darts players in Orkney. Orkney Golf Club, St Ola Cup winners. From left, Stevie Linklater, Keith Brumpton, Gordon Rendall and Kevin Peace. Shapinsay, St Ola Cup winners. Pictured from left are Ian Eunson, Jamie Marwick, Graham Rendall and Colin Leslie. The 2018/19 season kicked off last Monday with the Allied Hotels cup for 'A' teams. The three man team format usually throws up a few unexpected results, and the first giant killing of the season went to the young Nomads boys over the Legion, with Ryan Wilkie putting Kevin Gray to the sword twice in the tie. Some early season rustiness was definitely on show, but there were some good darts thrown nonetheless. Brian Moar scored the first ton-plus checkout of the season, with a lowly 100 as his Wanderers side scraped through to the final. In the bottom half the Golf Club boys won through by defeating the Nomads, and in the final they were just too clinical for the Wanderers, winning 3-0 and collecting the first piece of silverware for the season. The 'B' boys got underway the following night with the St.Ola Cup, and KDDL debutant Dennis Watt made an exceptional start, hitting two 180s, a 100 checkout and an 11 dart leg in his first match. His Exiles team made the semi final but lost out to RBL2. Waiting for them in the final were Shapinsay, who had dispatched Quoyburray and Young Loons en route, and it was the islanders who ran out 3-1 winners. The 2018-19 committee is: president Craig Taylor; vice-president Stevie Linklater; treasurer David Henderson; secretary Brian Moar. Committee members: Robbie Stanger, Brett Dickinson, Ian Linklater, Robbie Norquoy & Richard Polson. 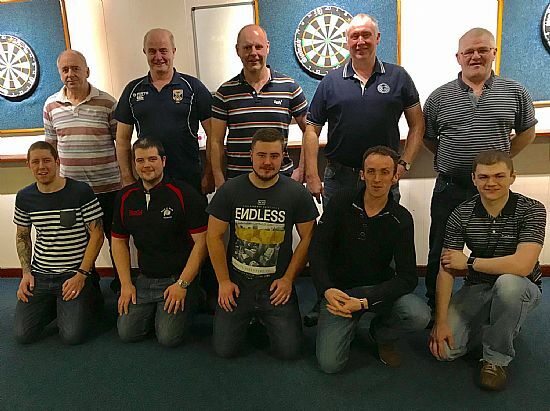 Kirkwall and District Darts League held its annual general meeting in the Kirkwall Legion last Thursday. A slight improvement on numbers present from the previous year heard detailed reports from league president Craig Taylor, giving an overview of the 2017-18 season, while treasurer David Henderson supplied the facts and figures surrounding the financial status of the league. Seven of the eight committee from the previous year had intimated their wish to stand again, and were duly elected unopposed. With no formal requests having been received in writing for any new committee members, it was opened to the floor and Richard Polson agreed to stand. Retiring vice president Robbie Stanger later agreed after the meeting to stand again to make up the numbers needed. Craig Taylor remains as president, while Stevie Linklater moved into the vice president role. With secretary for the past 50 years Jim Scollie having sadly passed away during the previous season, only Brian Moar had intimated his wish to fill the vacancy and this passed unopposed. A few changes were made during the AGM which will come into effect. There will be a verbal any other business part to the AGM, although it was stressed that any major issues, especially concerning constitutional alterations or large scale reconstruction of league structure are to be in writing two weeks prior so they can be included in detail on the agenda. It was proposed to have the league starting later and finishing earlier, and a draft fixture schedule including such changes were put forward and accepted. There was also a call for the mixed A & B cups to be scheduled for a Friday night where possible, and to trial plate competitions at these to give teams a guaranteed couple of games each night. This was also included and altered in a draft cup fixture schedule, subject to availability of the venues stated. The main change was the proposal which was carried which will see the committee propose to their Shetland counterparts for a 'B' county match between players from the lower leagues in each organisation for a trial period of two seasons, with the KDDL side being selected from the current 'B' ranking point system already in place, with the one condition being that 'B' players wishing to be selected must also take part in at least four of the seven main ranking competitions. This can only go forward if agreed by Shetland Darts Association who have a meeting this week. 24 teams have entered the KDDL this season, 12 in each of the A and B leagues, with 2 up and 2 down at the end of the season as agreed at last years AGM. A league: Legion, Orkney Golf Club, Commodores, Untouchables, Wanderers, Sanday, Untouchables 'A', Legion Arrows, Quoyburray 'B', Warriors, Nomads and Bilco Boys. B League: Quoyburray, Shapinsay, Murray Arms, Sands, Muppets, Young Loons, Vikings, Sanday 'B', Tankerness, Tigers, Exiles and RBL2. Cup games commence from Monday, September 3, with League matches scheduled to start on Monday, October 1. As usual, updates on KDDL activity can also be found on the Orkney Darts Facebook page throughout the season. Registration books can be obtained now from committee. See Orkney Darts Facebook page for update, info and contact details. 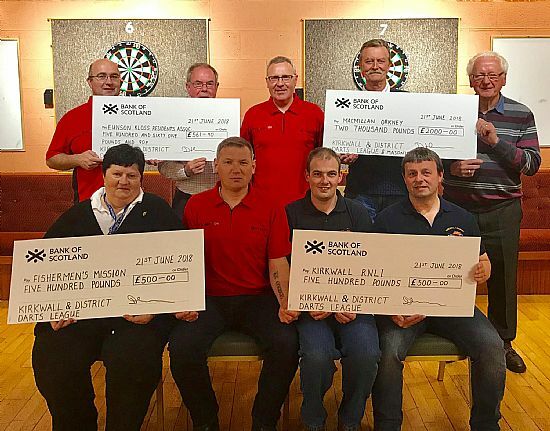 Kirkwall and District Darts League carried out its annual charity cheque presentations which saw a total of £3,561 donated to local good causes. Brian Moar, David Henderson, and Craig Taylor from the league presented Marcus Vile and Kevin Wooldrage from Kirkwall RNLI with £500, Kirsty Sinclair from the Fishermen’s Mission with £500, and Jack Mcintosh from Eunson Kloss Residents Association with £561.90. John Muir of Orkney MacMillan House was presented with £2000, which was raised between the league May weekend charity darts, and a gin tasting night organised by the Kirkwall Masonic recreation club chairman Mark Wroath, also pictured. Huge thanks once again to everyone who came along and supported the events throughout the year. Darts league president Craig Taylor said: "Huge thanks once again to all everyone who came along and supported our charity events throughout the year. It is always a pleasure for the league to support numerous local good causes and carry out the cheque presentations at the end of each season." 2017/18 Roll of Honour from the darts presentation night listed below. As I said last night, thanks very much to everyone for making it such a successful season darts wise. Thanks very much to league sponsors Williamson's Butchers, and The Brig Larder for sponsoring the KDDL Orkney shirts. The support is very much appreciated by us all. Registration books are available now for next season by arrangement from committee. Enjoy the summer break! AGM is set for Thursday, Aug 16th, at 8pm, in the Kirkwall Legion. Deadline for agenda items and team entries, August 2nd 8pm. Pictured in the back row are members of Tattie Bogle's (Jim Scollie's) family. From left, Evelyn Sandison, Andy Scollie, Anna Flaws and Michael Scollie. 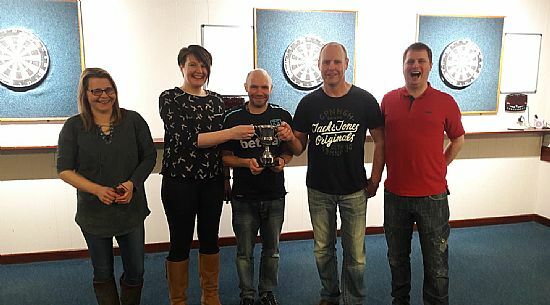 The annual Tattie Bogle Charity Shield took place in the Kirkwall Legion on Friday night, when Mark Shearer and Vanessa Robertson beat Brian Stevenson Jnr and Sarah-Jane Marwick in the final. Prize board winners were Rosie Davidson and Nikita Scollie. KDDL league president Craig Taylor said a huge thanks to everyone who generously donated prizes for the raffle, and helped on the night in any way. £364.40 was raised for Eunson Kloss Residents Association which will be added to the £187.50 raised at the Steven Flett Memorial Darts for the same very good cause. The last darts fixture of the season takes place on Saturday. It is the annual trophy presentation night and the usual fun mixed doubles darts - names out of the hat. Let’s make it a good night with a good turnout! It gets underway at 8pm in the Kirkwall Masonic. Registration books for the 2018/19 season will also be available on the night from KDDL committee members. 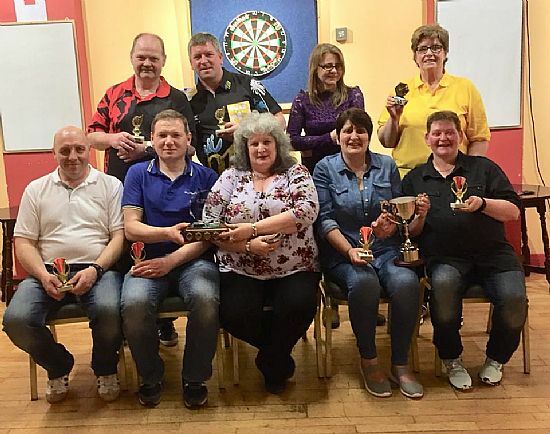 Pictured at the May weekend charity darts are, back row from left, runners-up John Marshall and John Kewlie, Nicky Laird and Hazel Groundwater. Pictured front from left are winners Stevie Linklater and Craig Taylor receiving their trophy from Charlie Tulloch, and ladies winners Jean Scott and Debbie Tait. 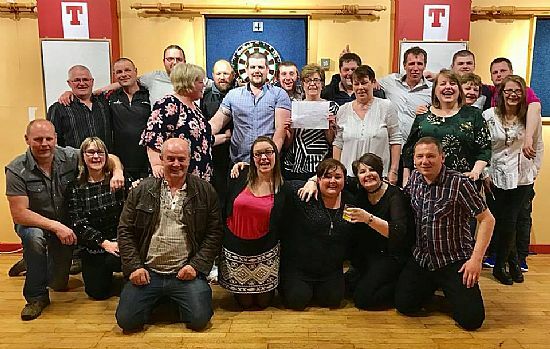 The annual May weekend charity darts took place in the Kirkwall Masonic on Friday night, when the amazing sum of £1300 was raised for Macmillan Orkney. On the night there are two competitions, men's and ladies doubles. In the ladies competition it was Jean Scott and Debbie Tait who claimed the trophy by beating Hazel Groundwater and Nicky Laid in the final. The winning ladies were presented with a brand new cup which was donated by ladies league president Hazel Groundwater in memory of Carole Celli who was always a great supporter of this event, and many other charity events. 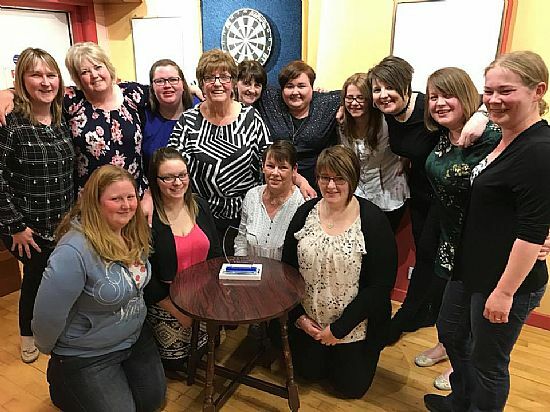 Mintlaw players, on their annual visit to Orkney for the May weekend, always came along to support the event, and this year was no different, playing some great darts and very generously supporting the fundraising on the night. 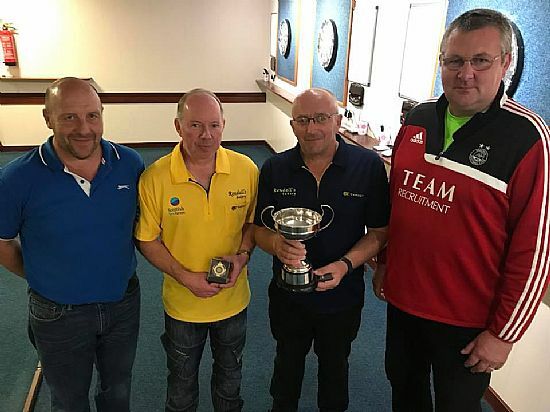 In the men's competition Craig Taylor and Stevie Linklater ensured the trophy stayed in Kirkwall by beating the Mintlaw visitors John Marshall and John Kewlie in the final. Huge thanks go to Charlie Tulloch from the Masonic for organising the fundraising raffle and bottle stall on the night, with helpers Liz Hay, Margaret Sutherland and Katie Croy. Charlie has also collected 5 pences in a jar over the year, and had organised a gin tasting in the Masonic later this month, with these proceeds also adding to the total raised for Macmillan Orkney, in memory of Carole. KDDL president Craig Taylor thanked all who very generously donated prizes, bought tickets, and had a go at the bottle stall and the bottle of port coin push. The eventual winner, after some fierce competition for the bottle was Gary Wilson. The darts season is almost at and end, with just two events to go. The first is the annual Tattie Bogle Charity Shield which takes place this Friday at 7.30pm in the Legion. There will also be a raffle and fun board competitions. 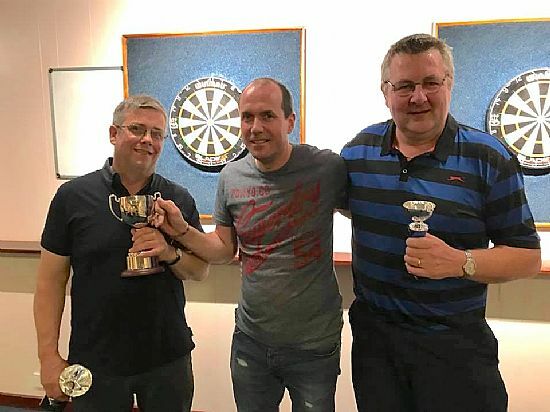 Funds raised at this mixed doubles event will be donated to Eunson Kloss Residents Association in memory of Jim Scollie and will be added to the money already raised at Steven Flett Memorial Darts last month. Donations for the raffle will be most welcome. 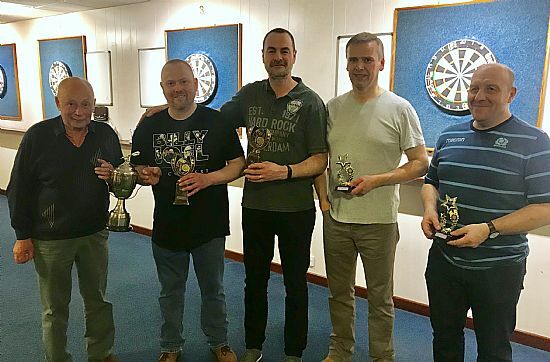 Then, the final event of the year takes place the following week, the annual men and ladies leagues trophy presentation and mixed doubles darts on Saturday May 17. Names by 7.30pm. There are still a small number of cups and trophies to come in, can they please be handed into the Masonic as soon as possible so they can be engraved. Team registration books for the 2018/19 season will also be available on the night, and from them on, from committee members on request. Tattie Bogle Charity Shield, Legion, 7.30pm. 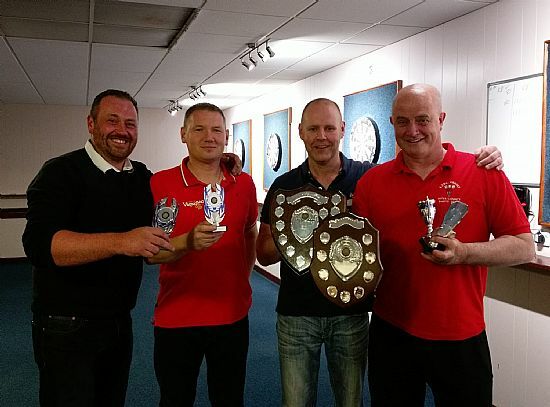 Darts Do - trophy presentation & mixed doubles. With the lighter nights marking the fact that the darts season is almost at an end, only two charity events remain, followed by the annual trophy presentation night, making the end of the darting year for the KDDL. This Friday the annual May charity darts fundraiser takes place in the Masonic, money from which will be donated to Macmillan Orkney, very much in memory of Carole Celli who always supported the charity fundraising at this event each year. The format is the usual two competitions, men's and ladies doubles, enter with a partner on the night. As well as the darts, there will be a raffle and bottle stall. Mintlaw players, on their annual visit to the county are also sure to be there supporting the event as always. The following Friday the annual Tattie Bogle Charity Darts takes place, money from which will be donated to Eunson Kloss Residents Association, added to the funds already raised at the Steven Flett memorial darts held the previous month. The curtain comes down on the season on Saturday, May 19, in the Masonic, with the trophy presentations & fun mixed doubles. Signing on books for the following season will also be available from committee. 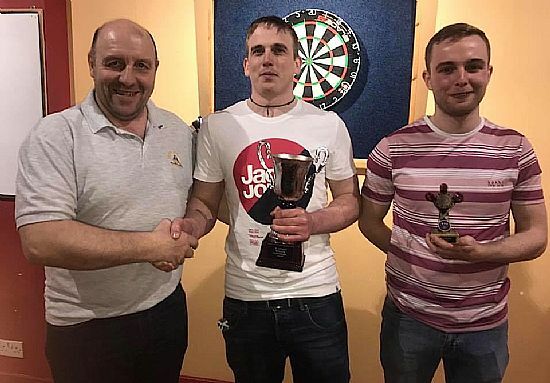 The Orkney championships darts play off took place in the Merkister Hotel on Friday night which saw a clean sweep for the KDDL. The Kirkwall Legion beat the Merkister team 11- 4 to regain the title of Orkney champions. 180's were scored by Wayne Monkman, Kevin Gray, Ian Findlay x2, Derek Firth x2 from the Legion, with Mal Reid and Paul Foubister from the Merkister also scoring one each. Robbie Stanger retained his singles title beating Paul Foubister 3-1 with 116 and 114 checkouts. Robbie and Stevie Linklater were doubles winners against Paul And John Munson in the playoff with a 3-1 scoreline. The mixed doubles winners were Kelly Harcus and Ivan Leslie who beat Lauren Gilmour and Erland Pirie 3-0. Thanks go to the Merkister Hotel who hosted the event and provided supper for the players. 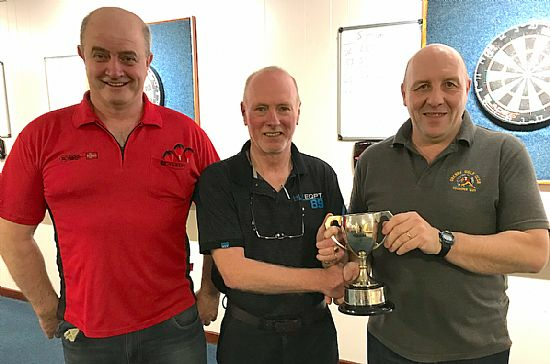 Darting history was made in the Lerwick Legion on Friday night when KDDL Orkney took on Shetland in the annual inter-county, in a match which saw the reds claim eight victories in -a -row, a feat never achieved before in the history of the competition which dates back to season 1971/72. Ian Linklater also took the mens anniversay shield. Full match report on the Inter-County News and Archive page.